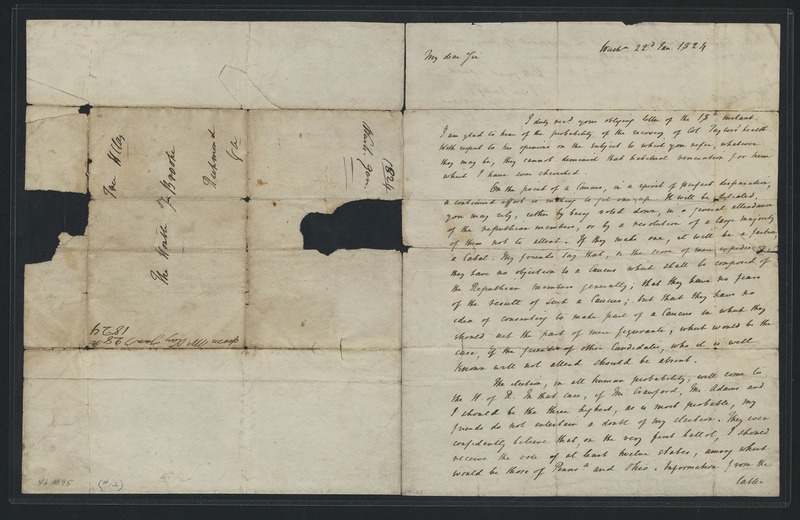 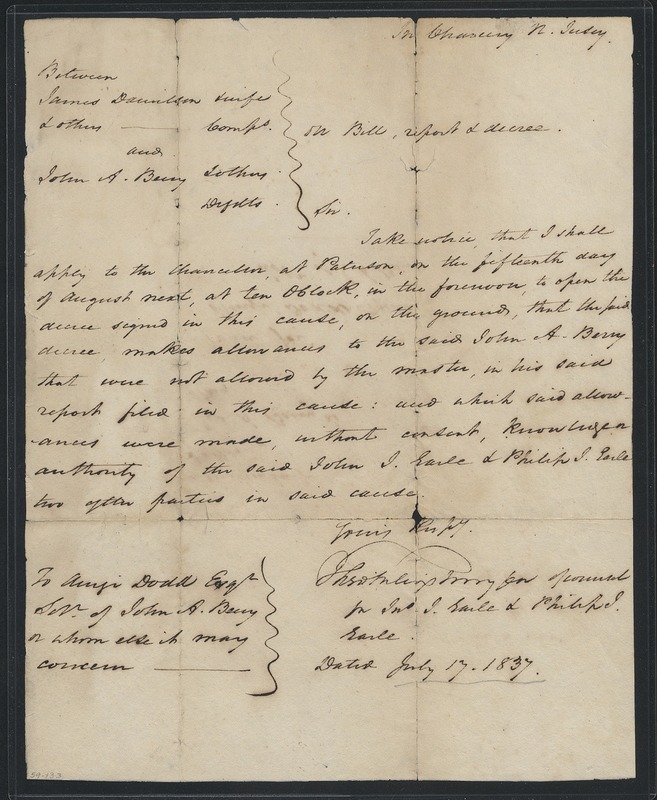 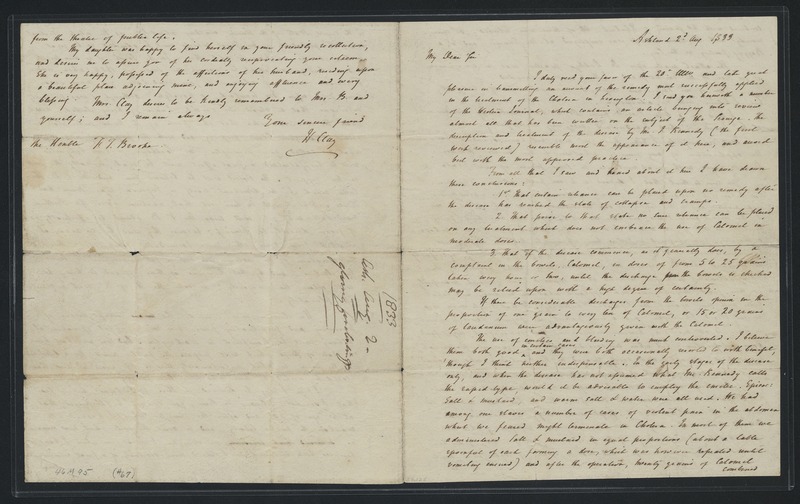 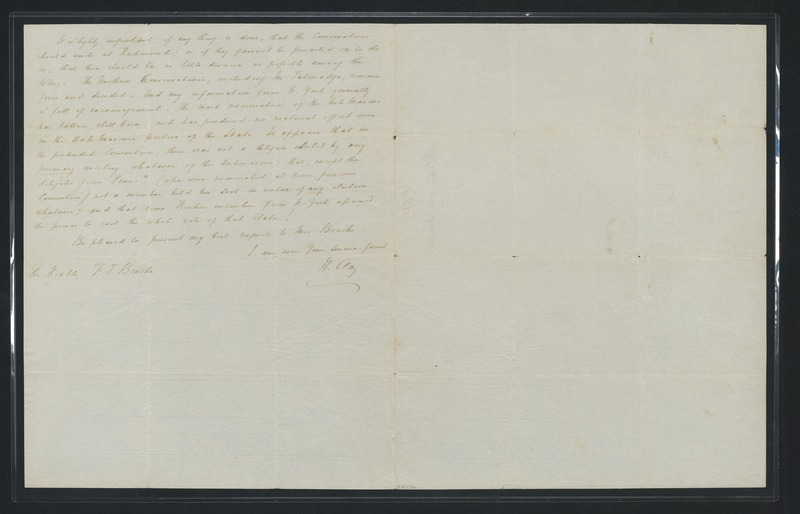 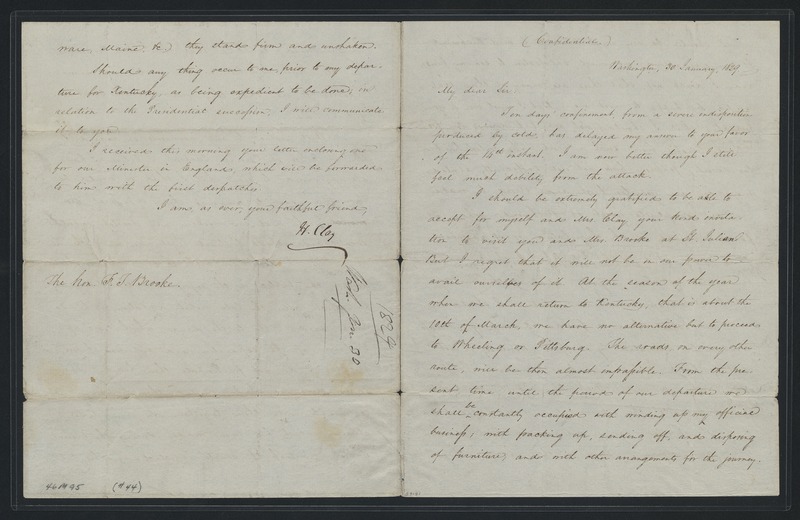 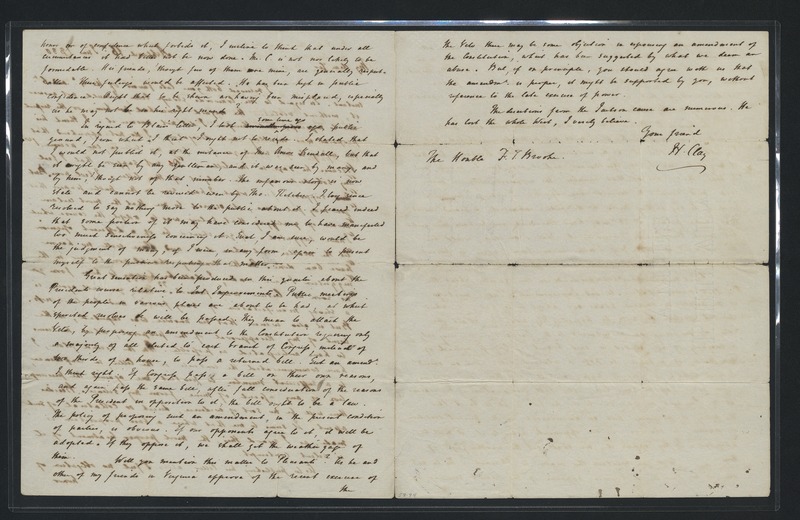 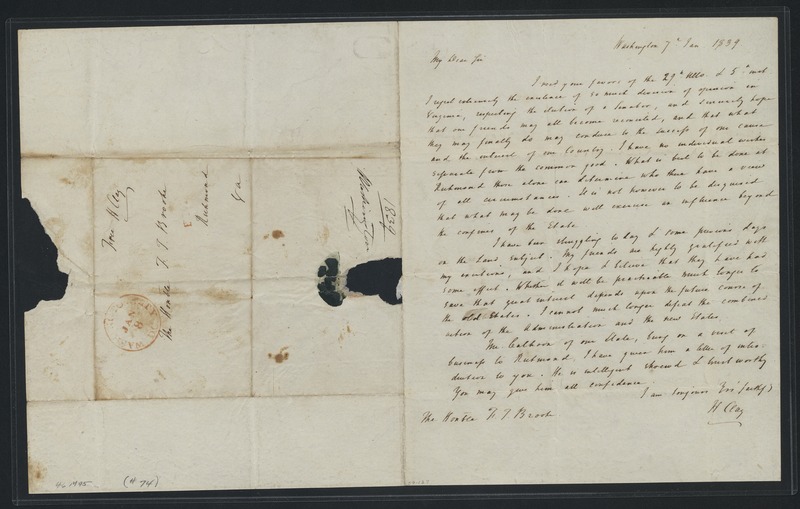 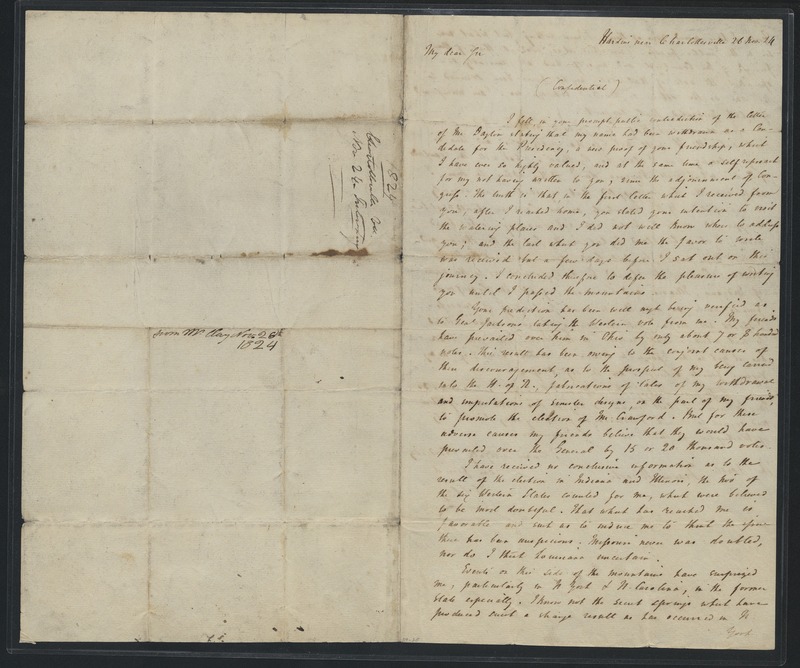 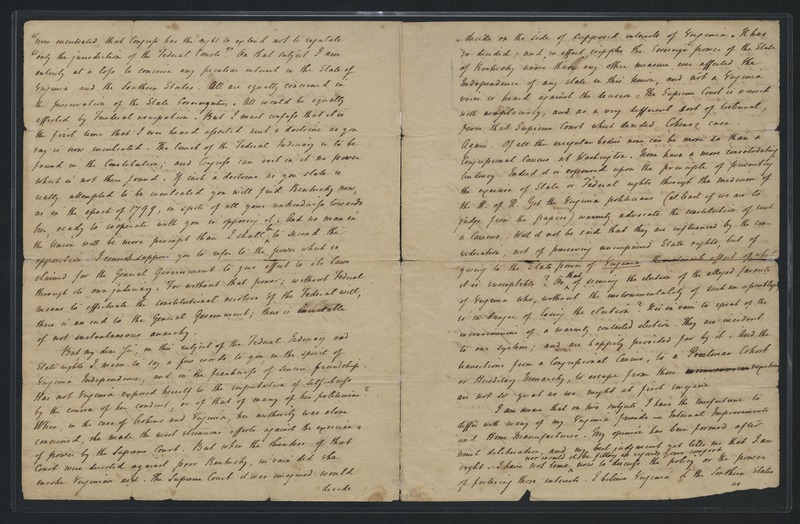 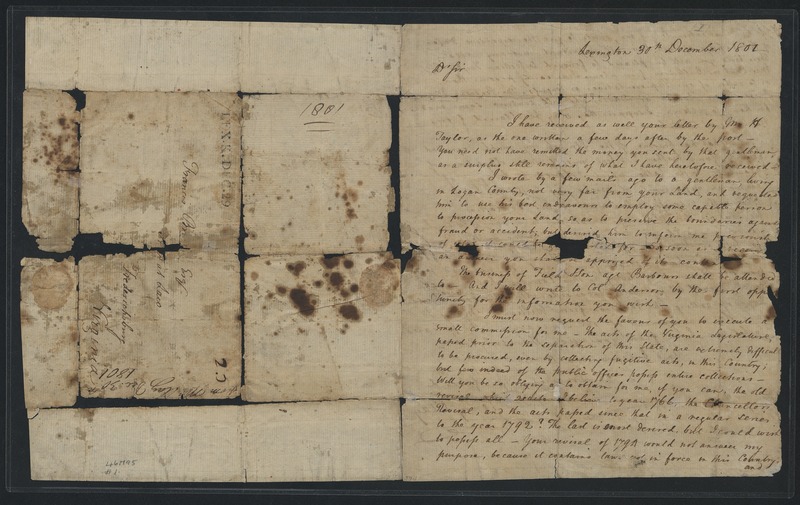 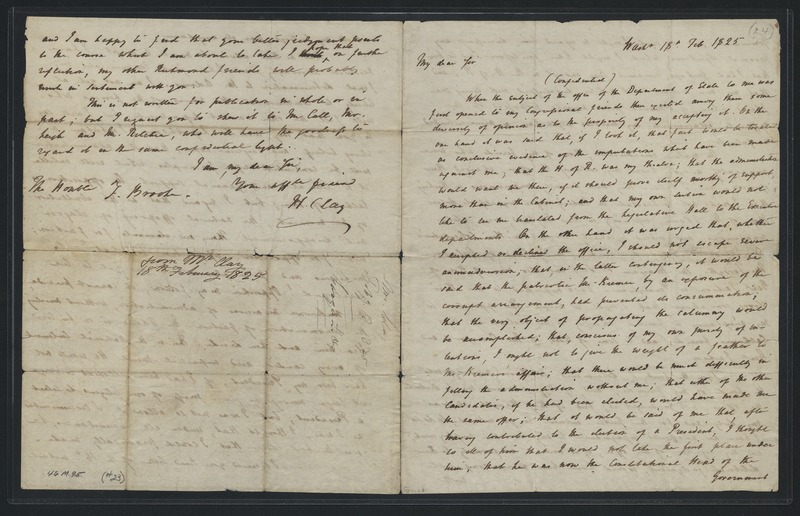 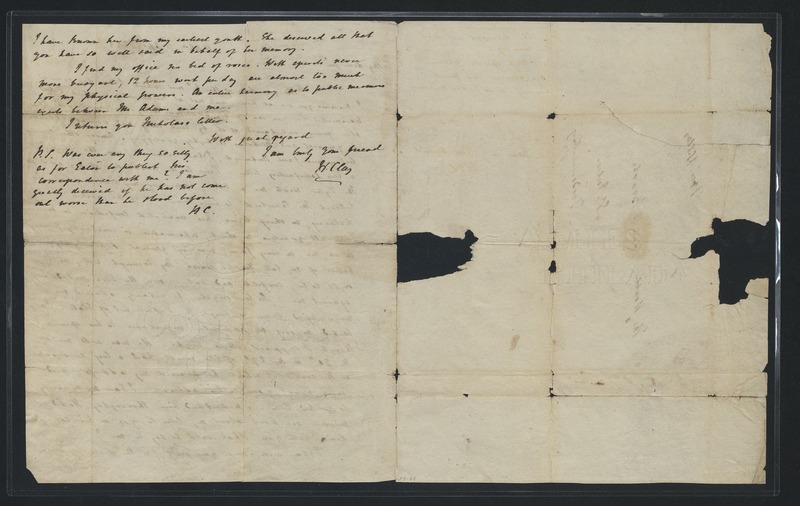 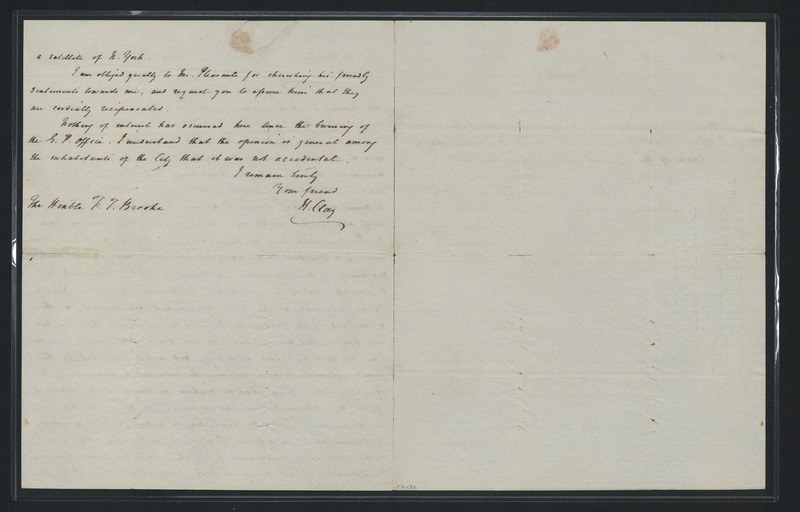 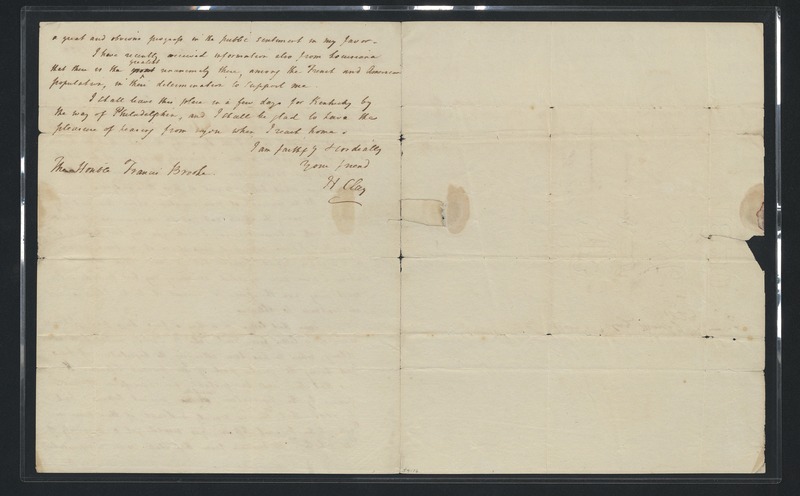 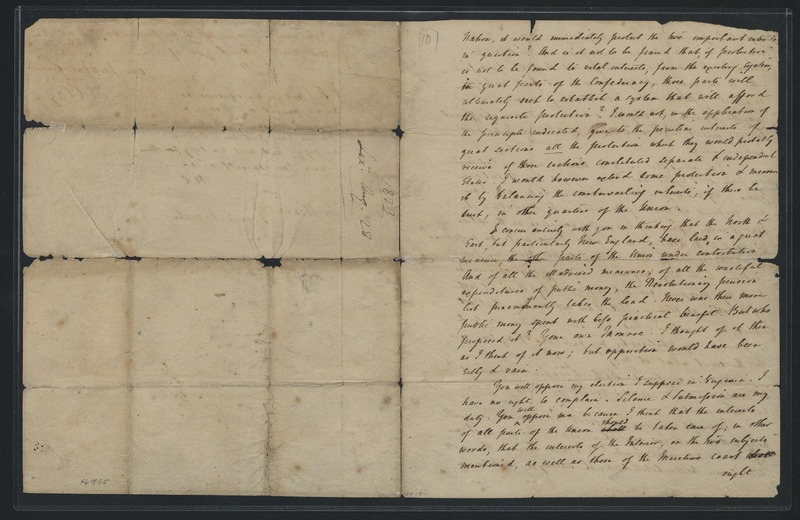 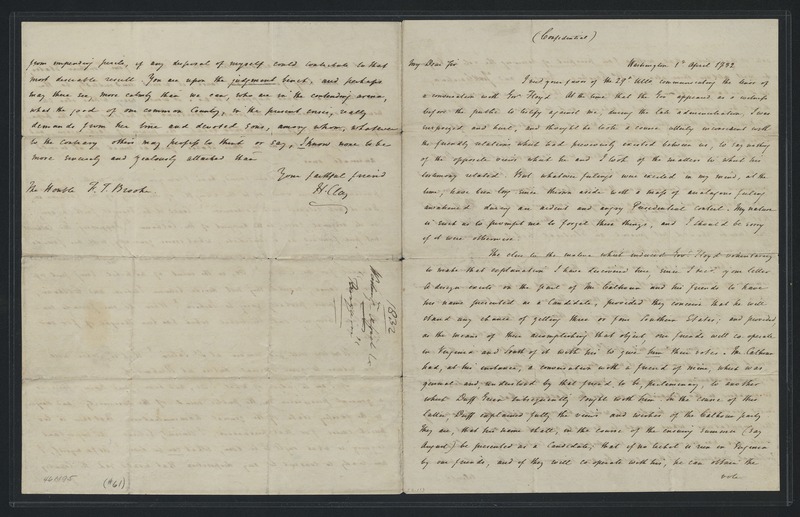 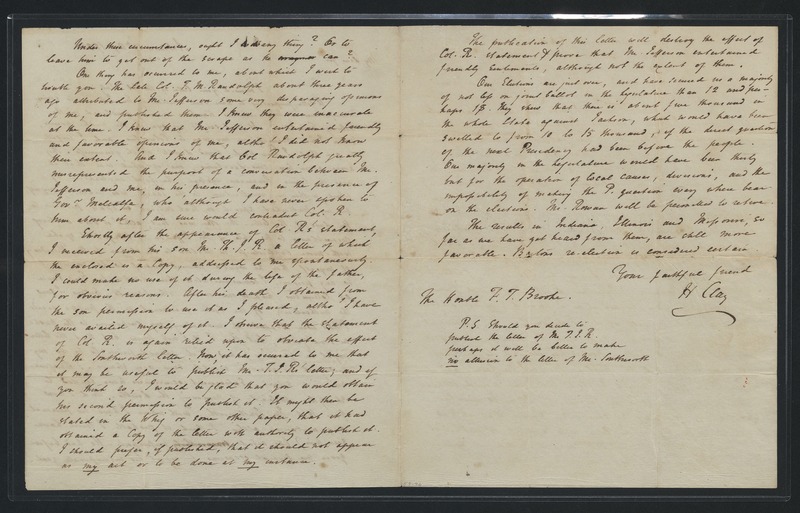 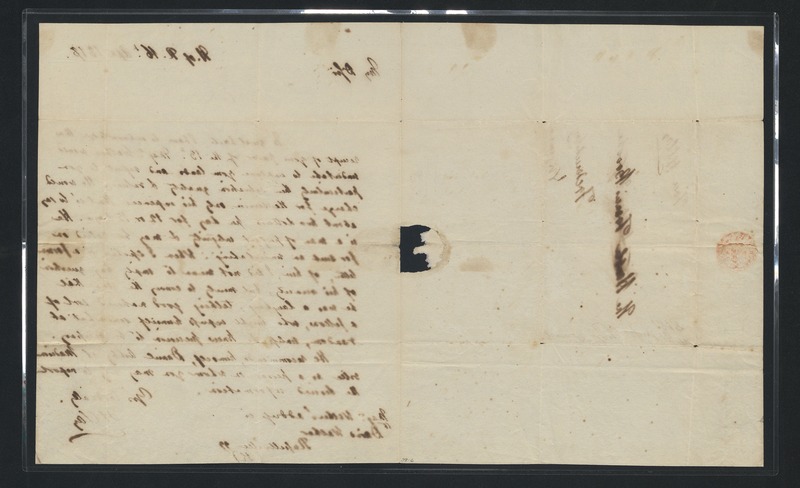 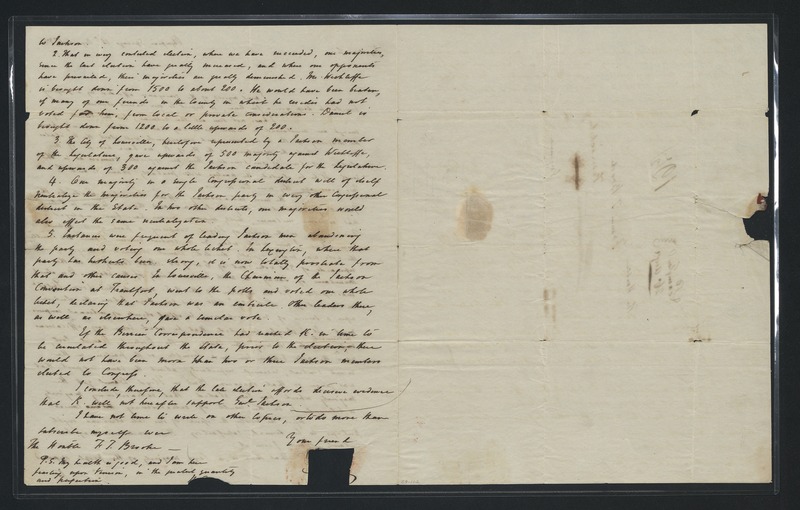 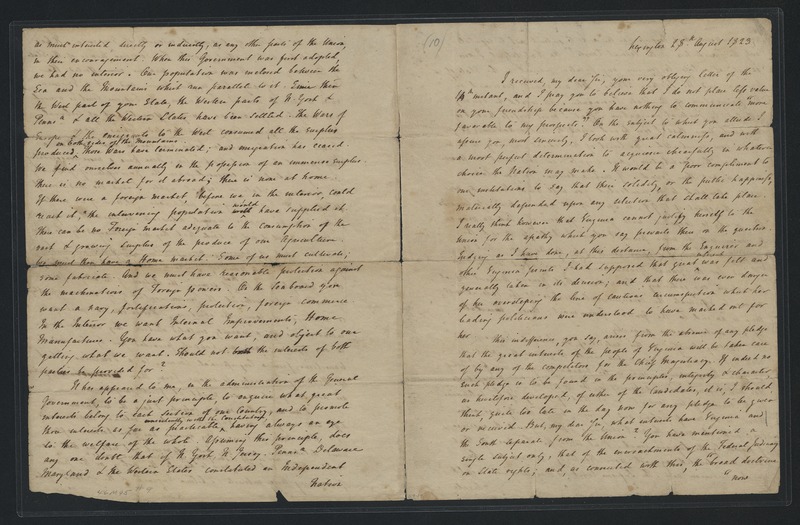 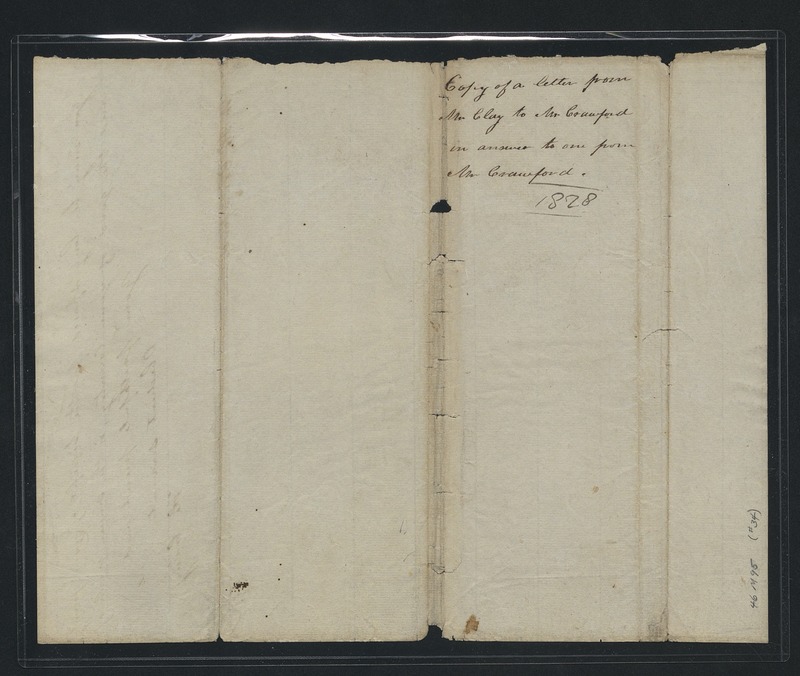 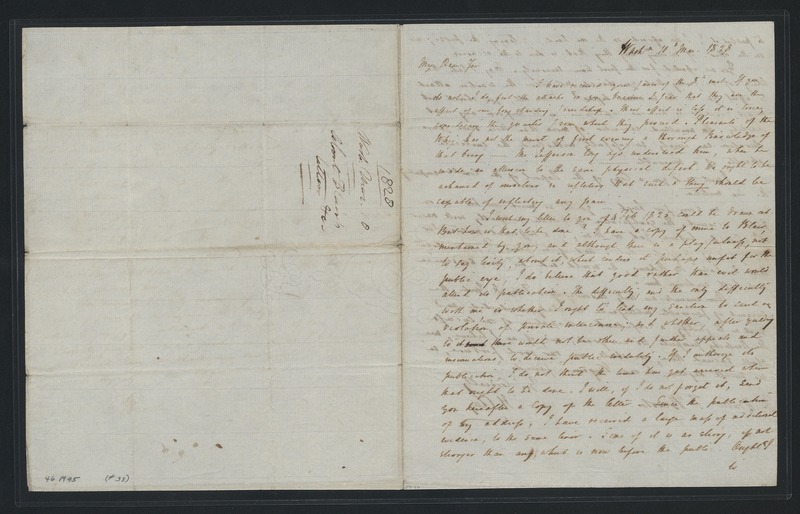 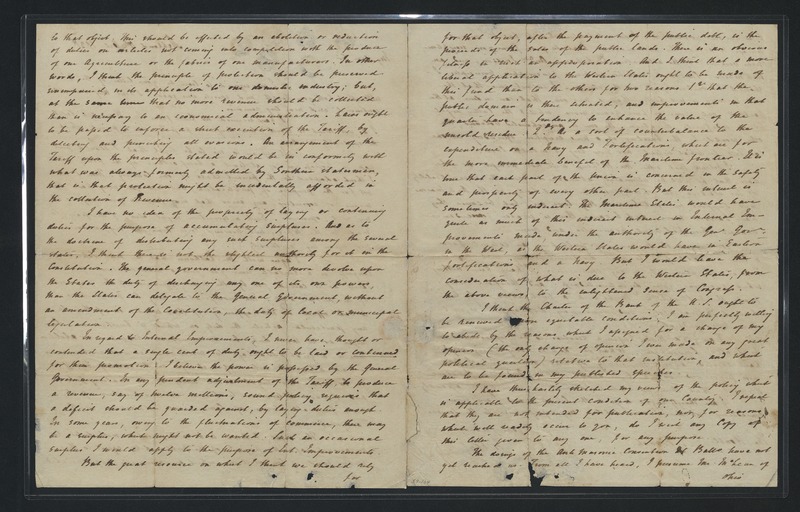 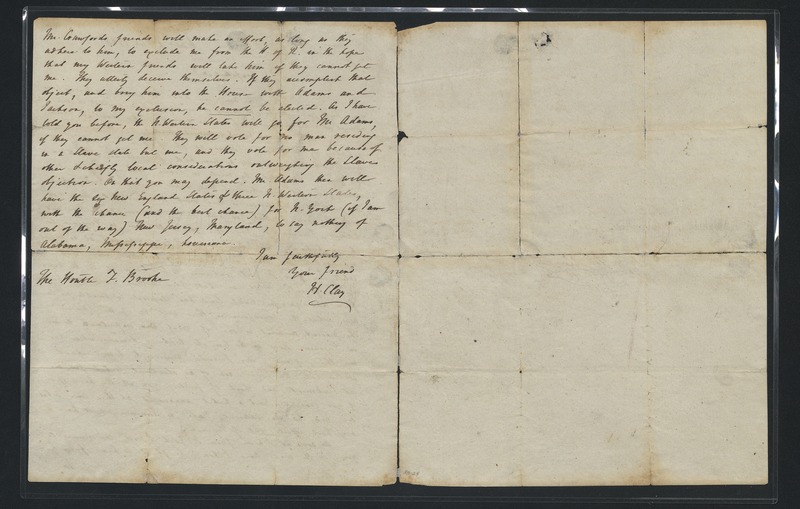 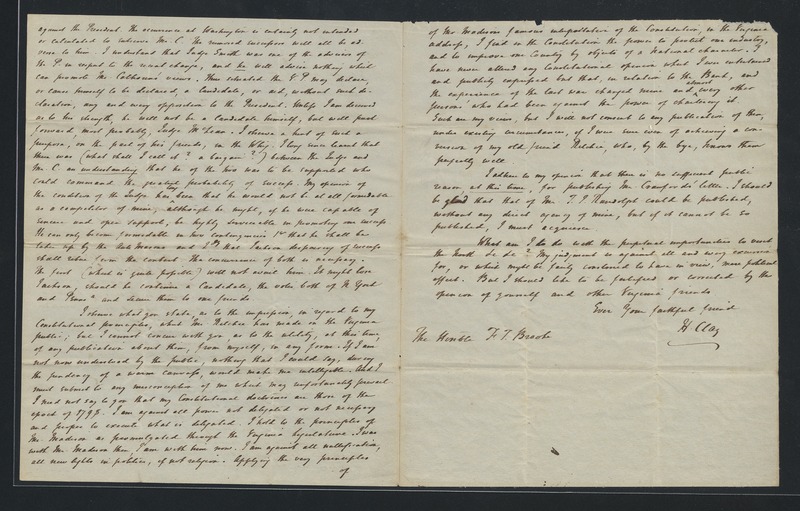 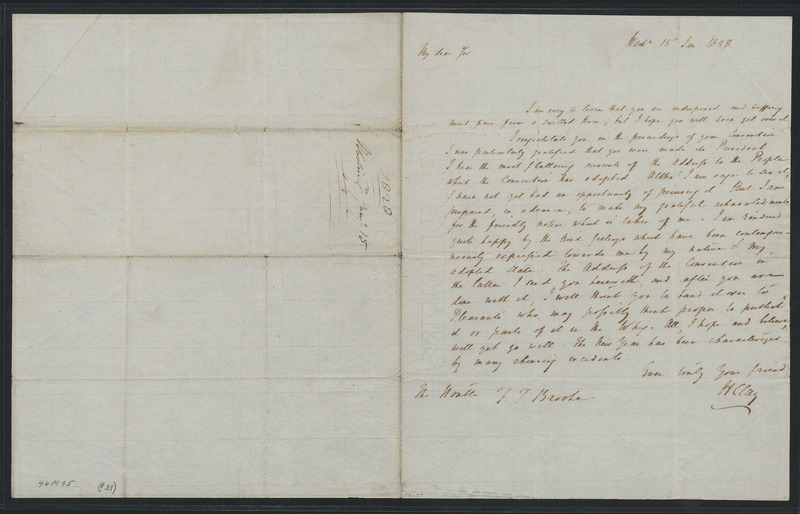 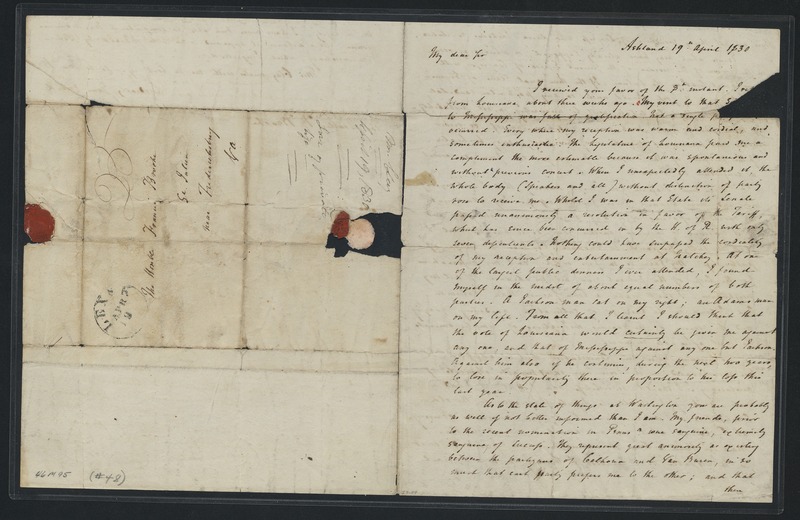 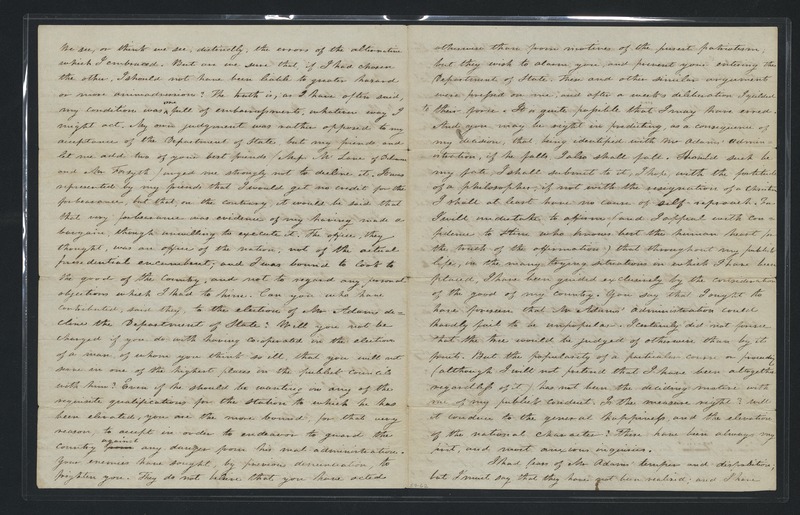 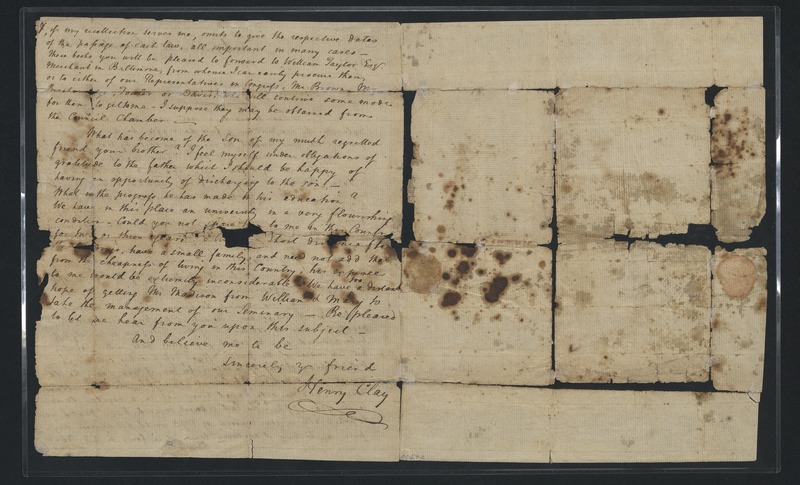 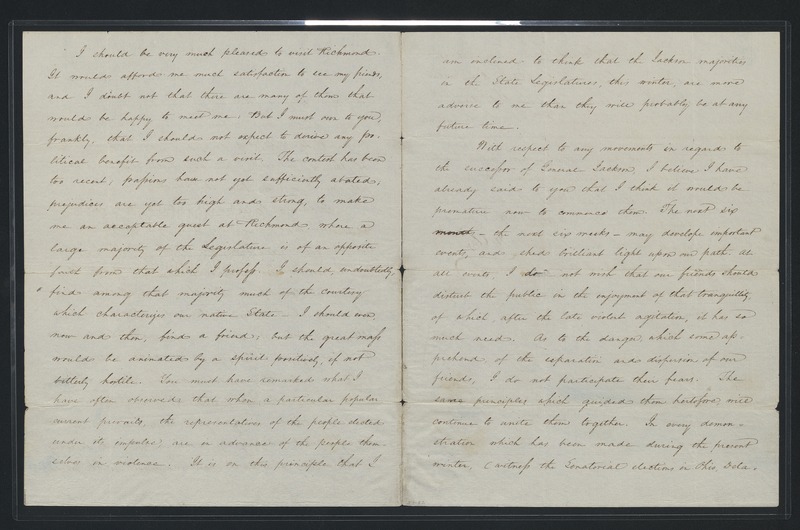 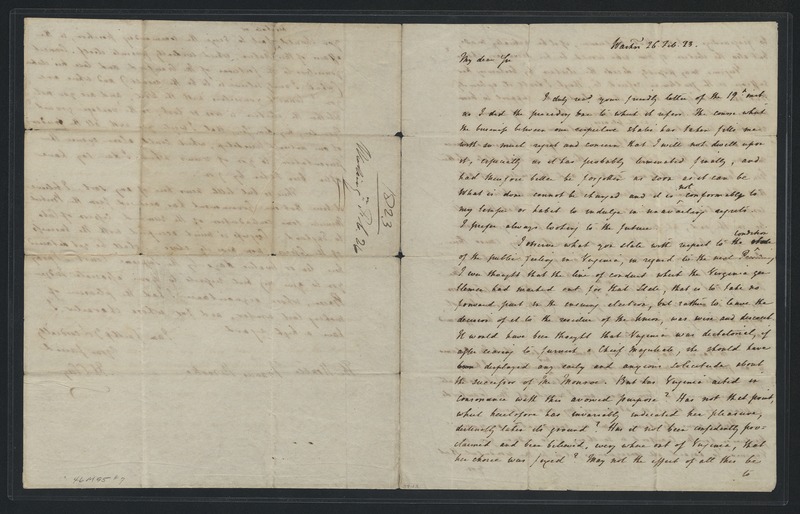 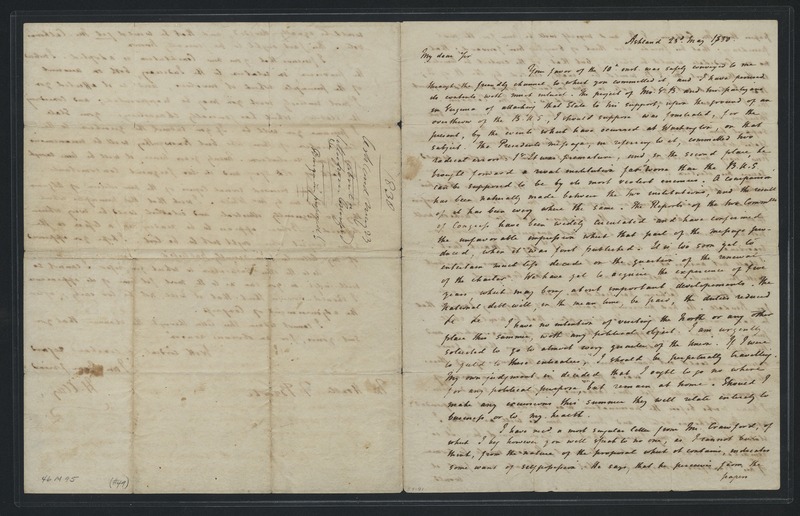 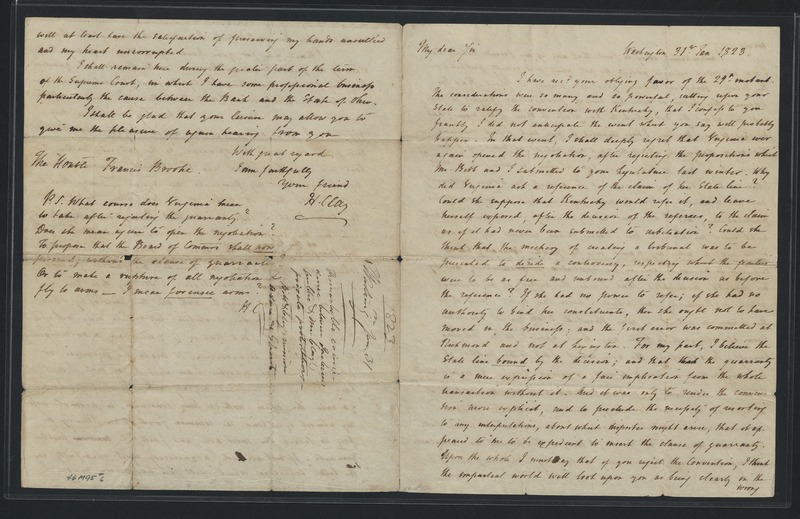 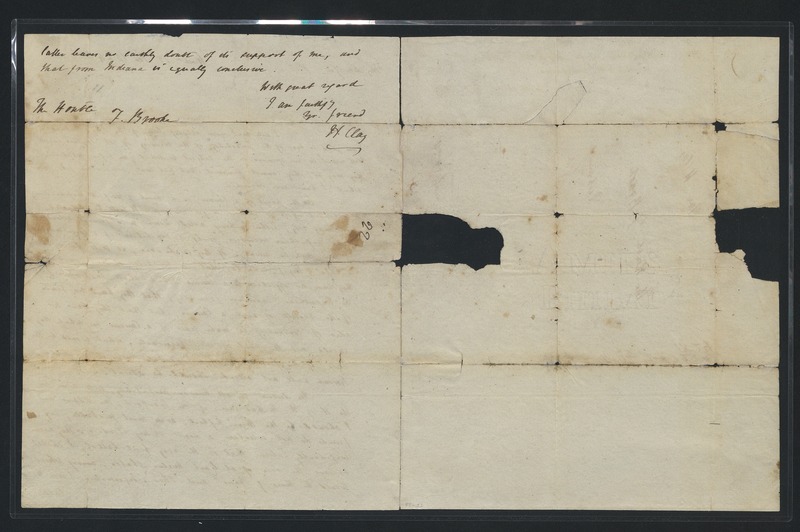 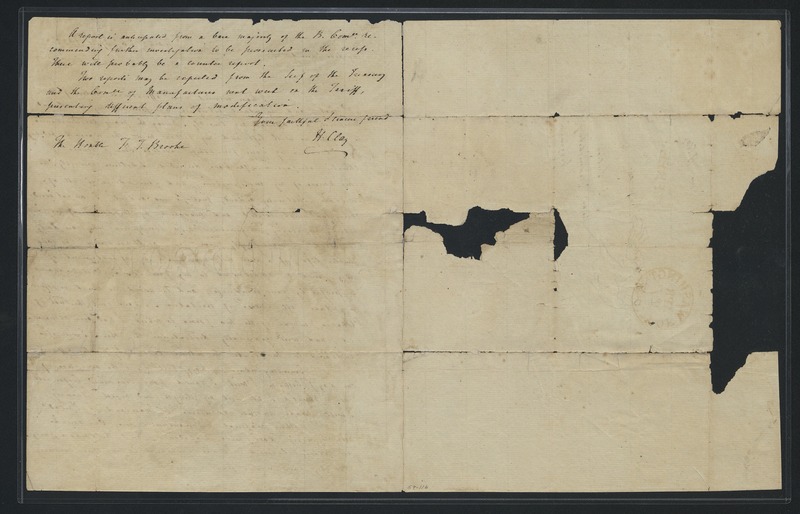 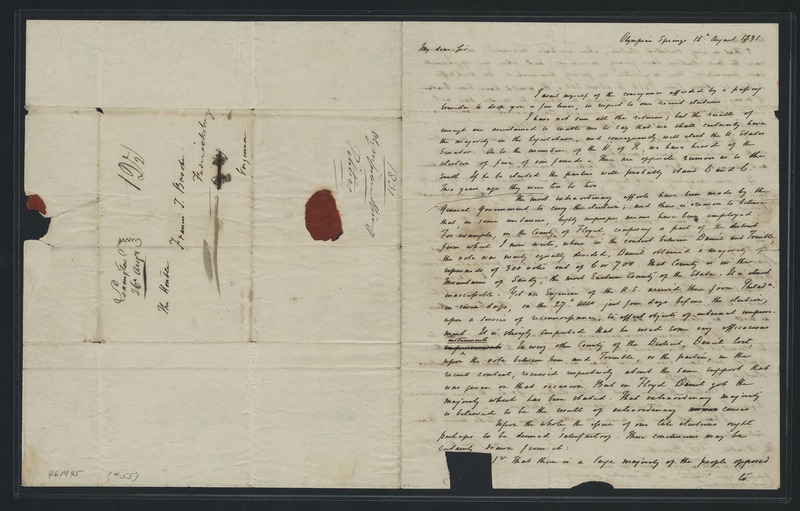 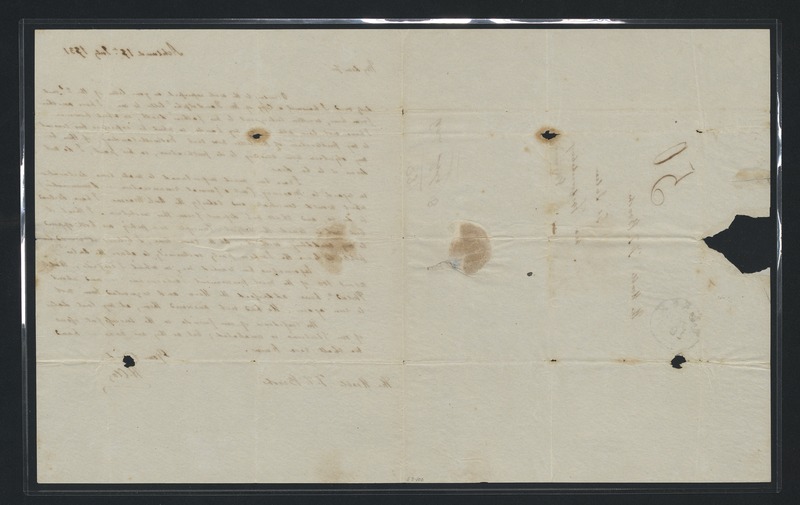 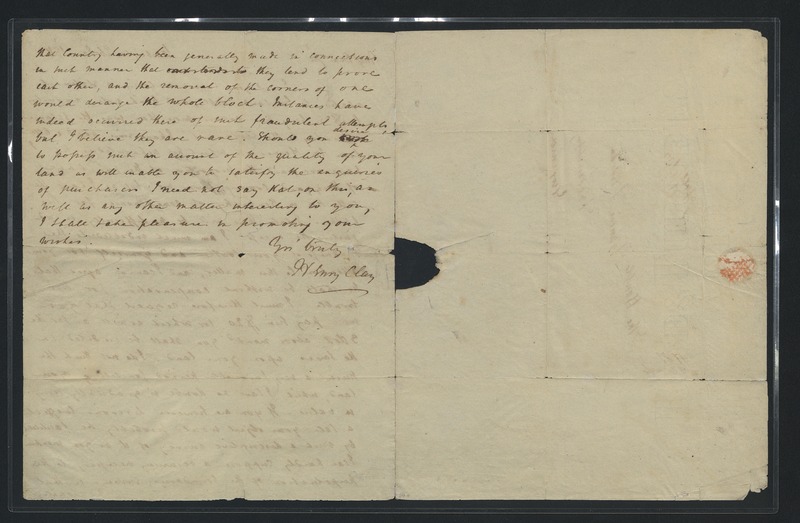 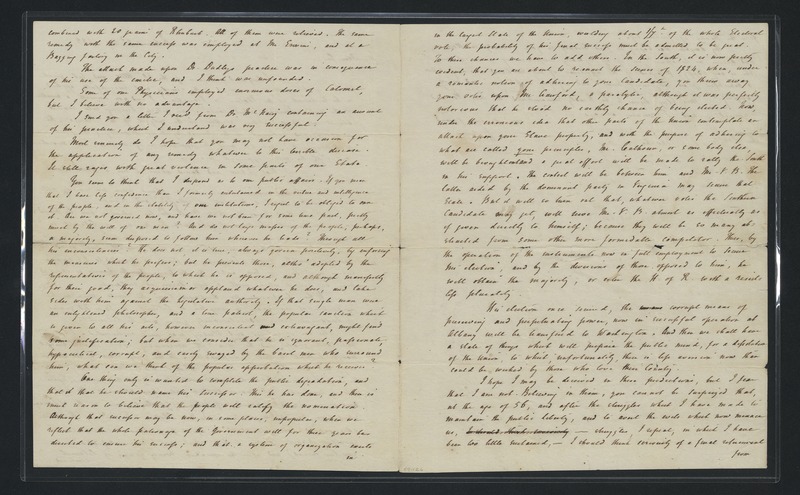 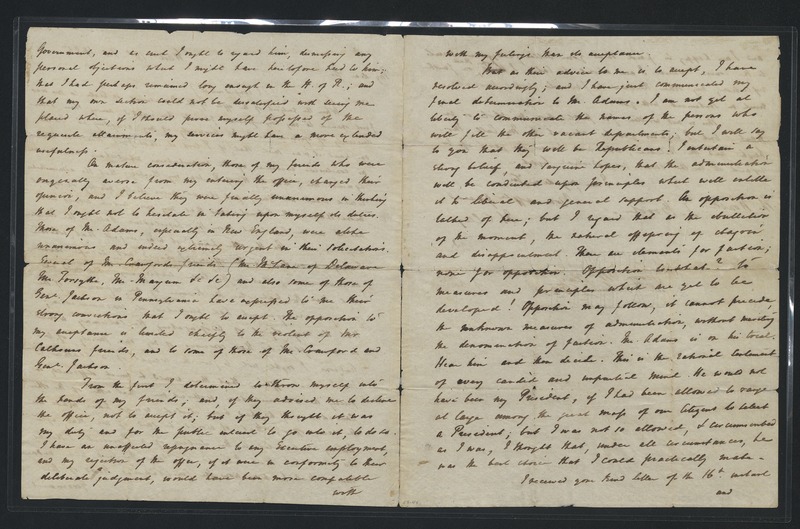 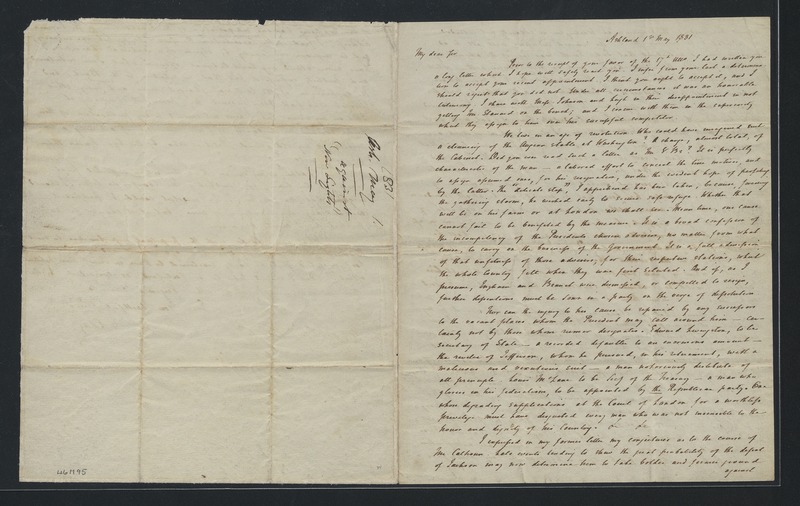 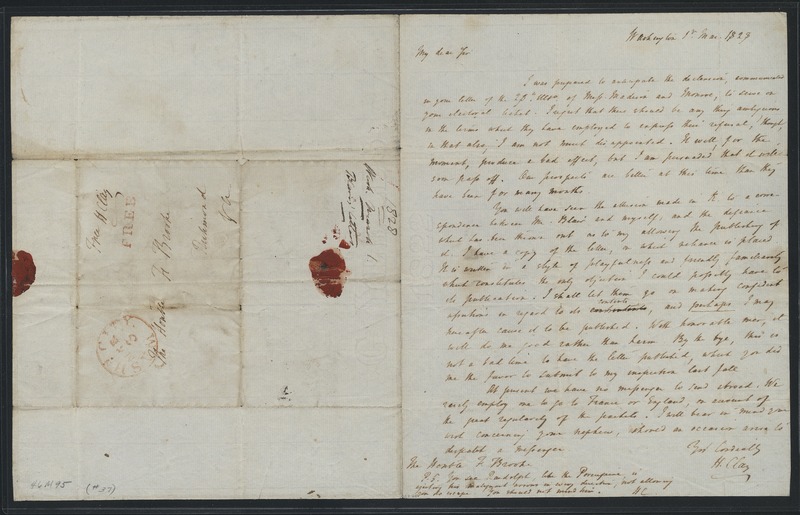 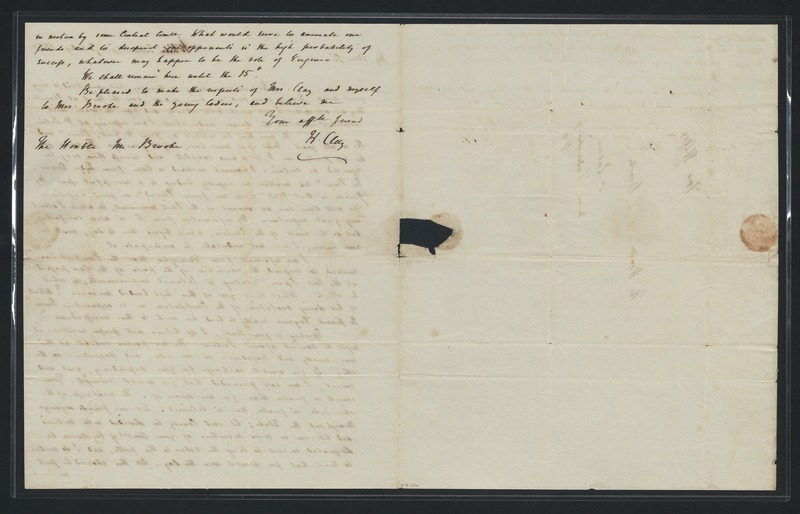 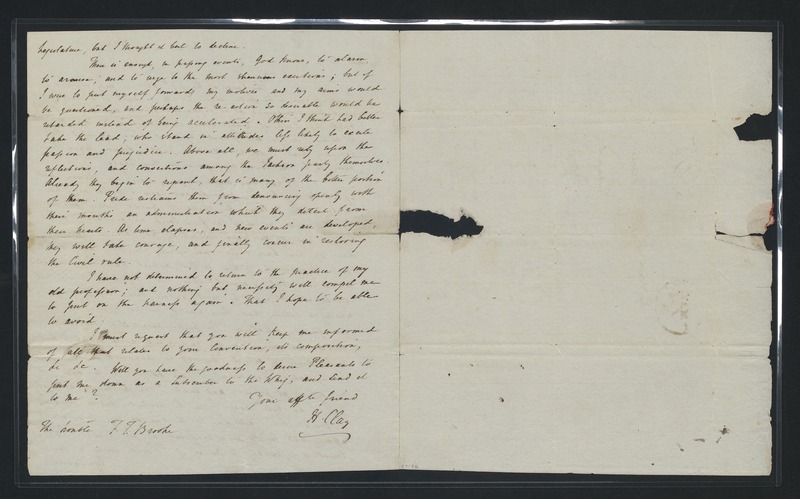 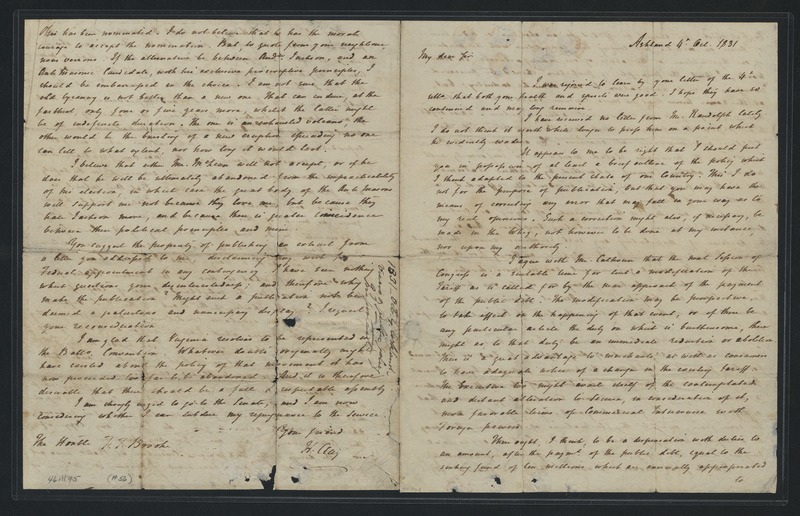 46m95: [identification of item], Henry Clay papers, 1801-1843, University of Kentucky Special Collections. 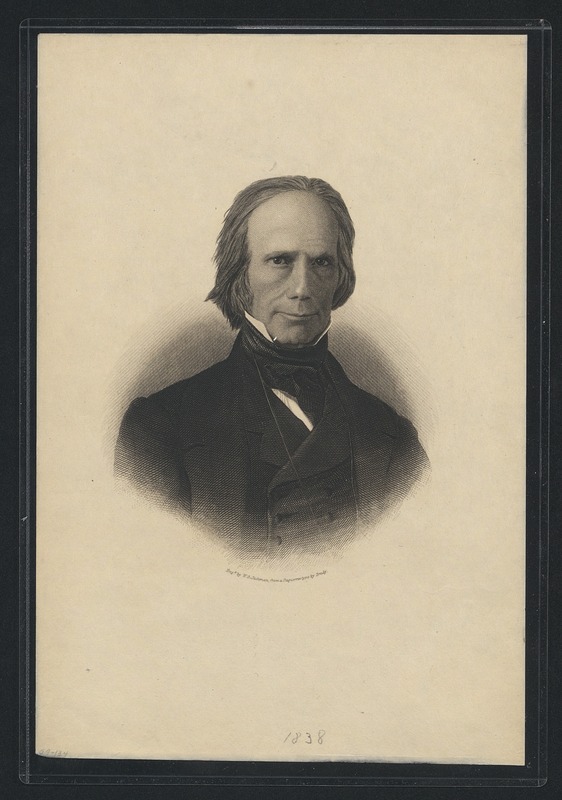 Congressman, politician, and senator Henry Clay was born on April 12, 1777, in Ashland, Virginia, to John Clay (1754-1781) and Elizabeth Hudson (1750-1829). 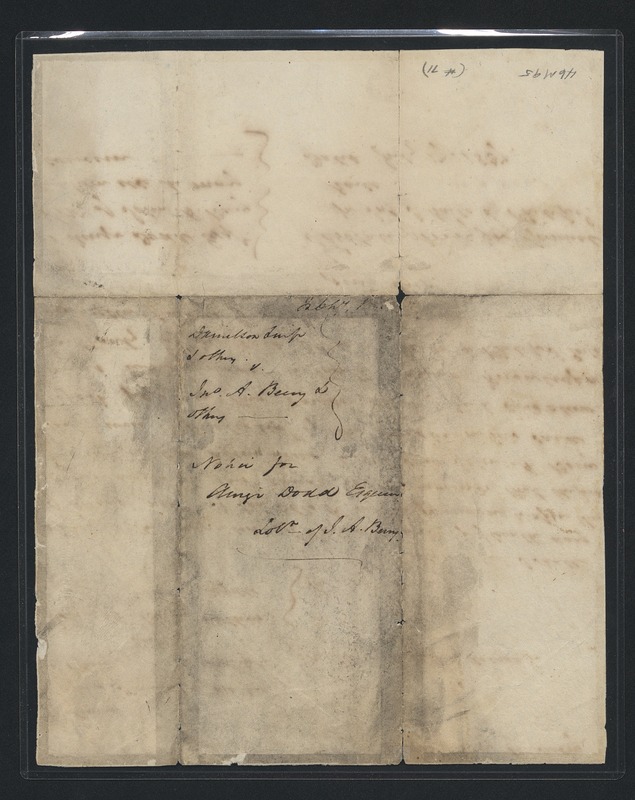 He studied law in Richmond, Va. and finished his studies in 1797. 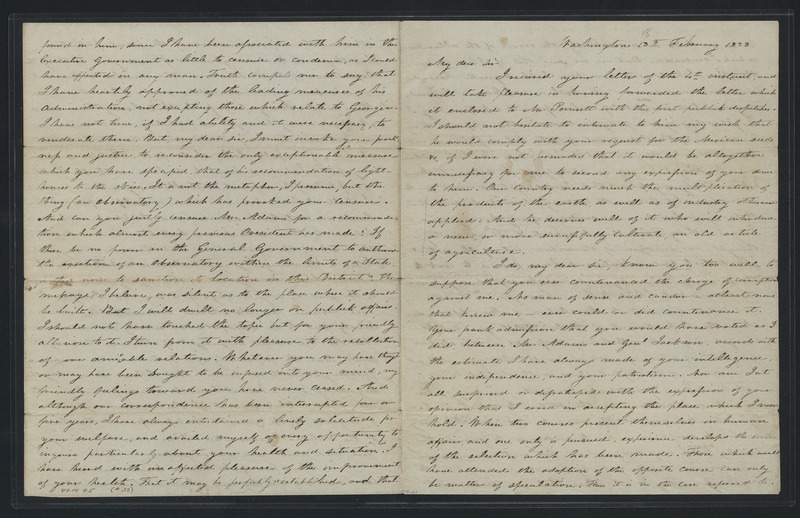 He was a member (1803-1806) and Speaker (1807-1810) of the Kentucky legislature and represented Kentucky as a United States Senator (1806-1807, 1810-1811, 1831-1842, and 1849-1852) and as a member of the U.S. House of Representatives (1811-1814, 1815-1821, and 1823-1824). 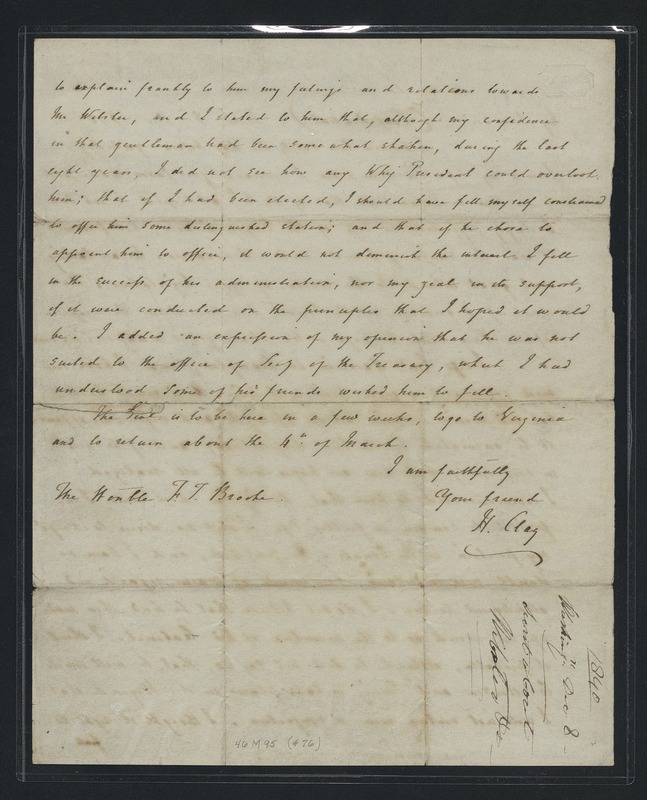 During all but one of his years of service in the House of Representatives, he served as Speaker. 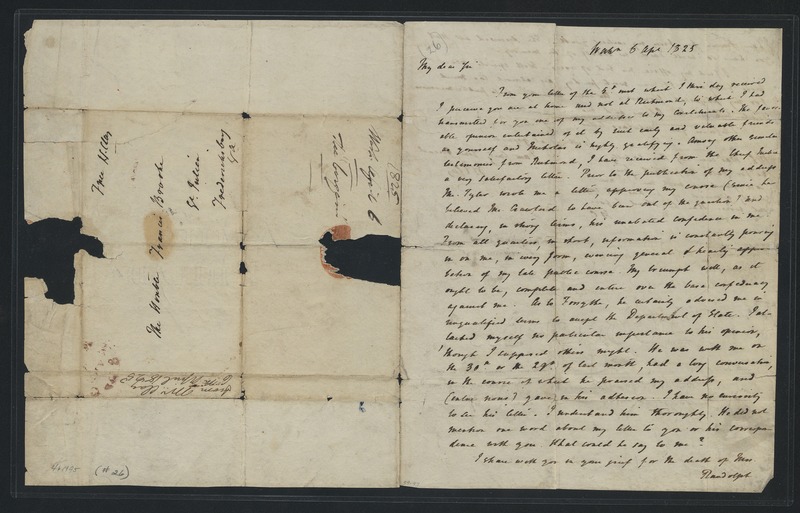 Additionally, Clay served as John Quincy Adams' Secretary of State (1825-1829) and ran unsuccessfully for President in 1824, 1832, and 1844. 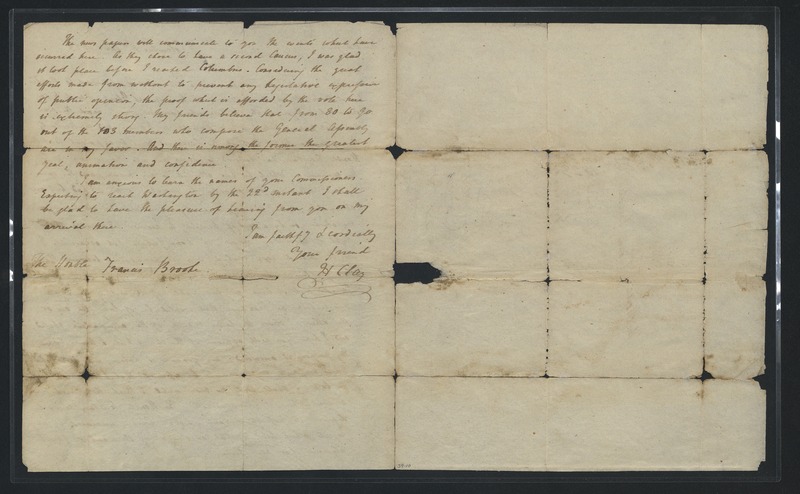 His efforts in the Legislature to avoid dissolution of the Union over the slavery issue included the Missouri Compromise of 1820 and the Compromise of 1850. 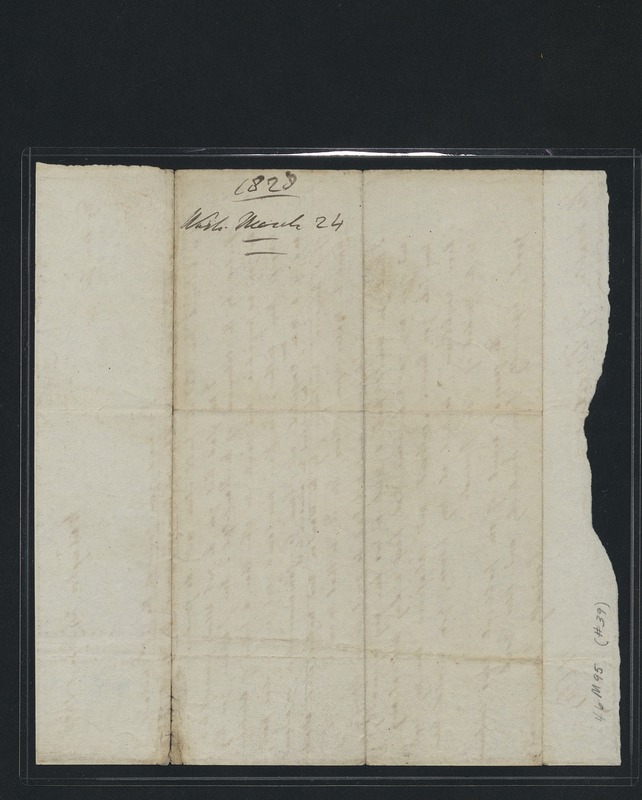 He married Lucretia Hart (1781-1864) in 1799; they had 11 children. 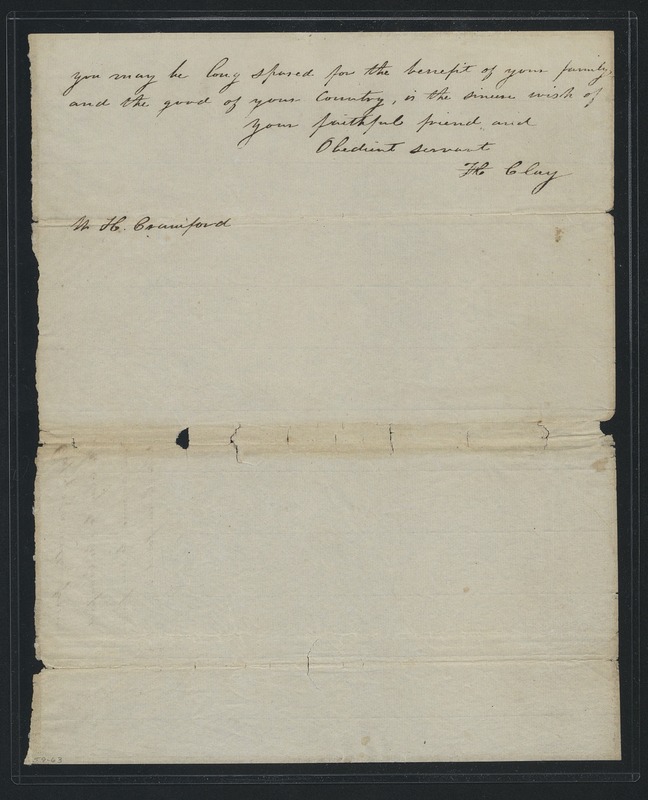 Clay died on June 29, 1852 in Washington, D.C. and was buried in Lexington, Kentucky. 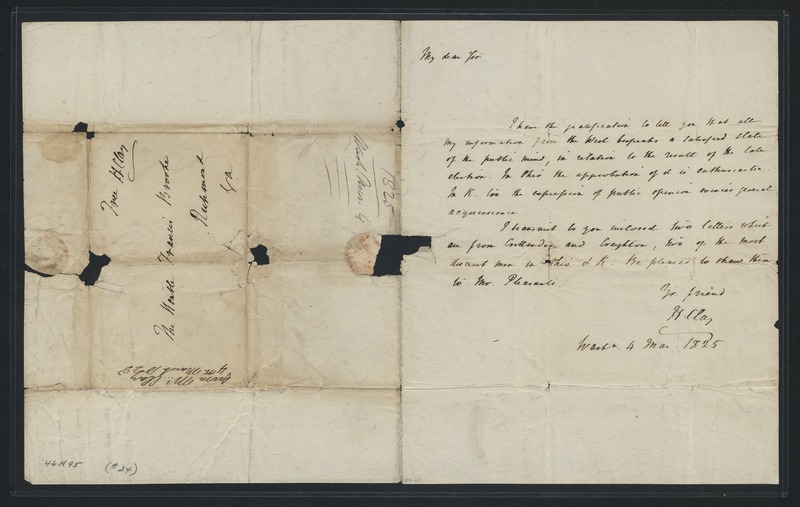 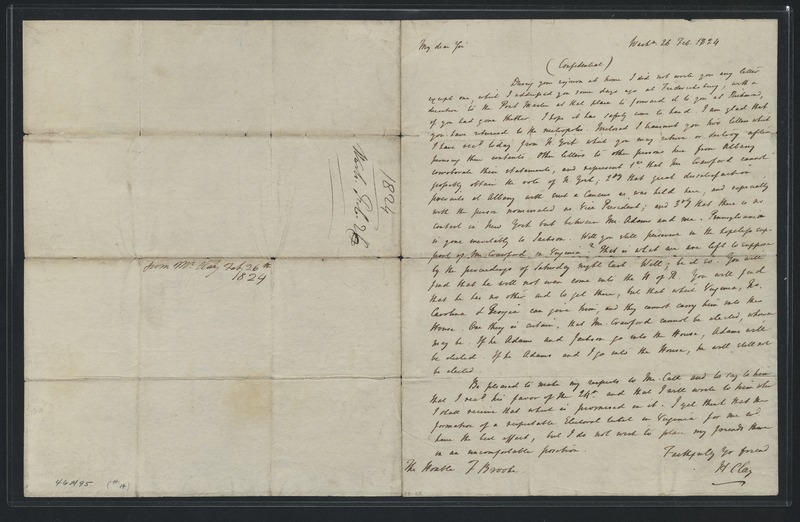 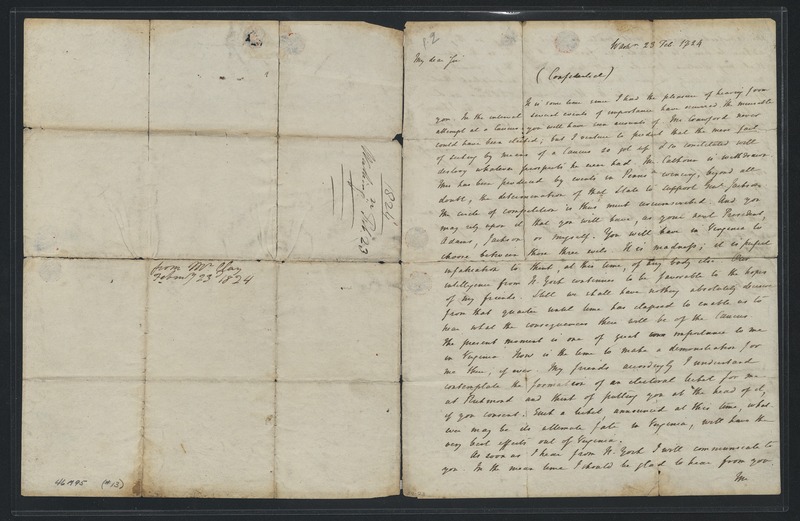 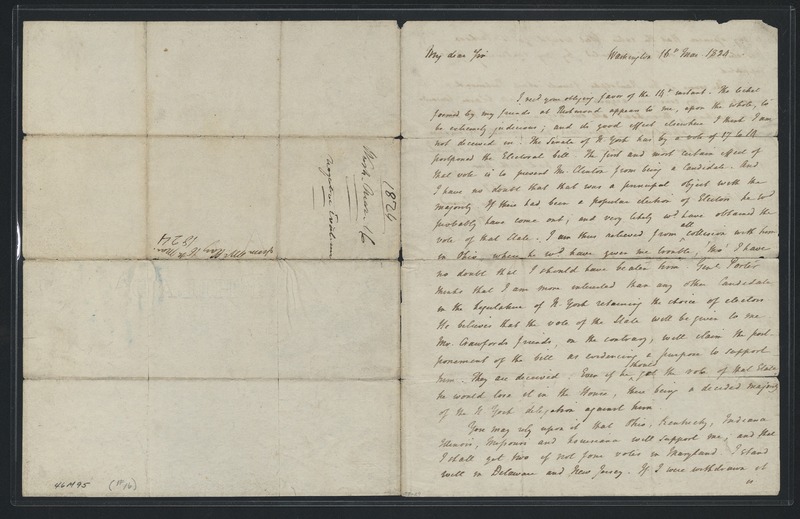 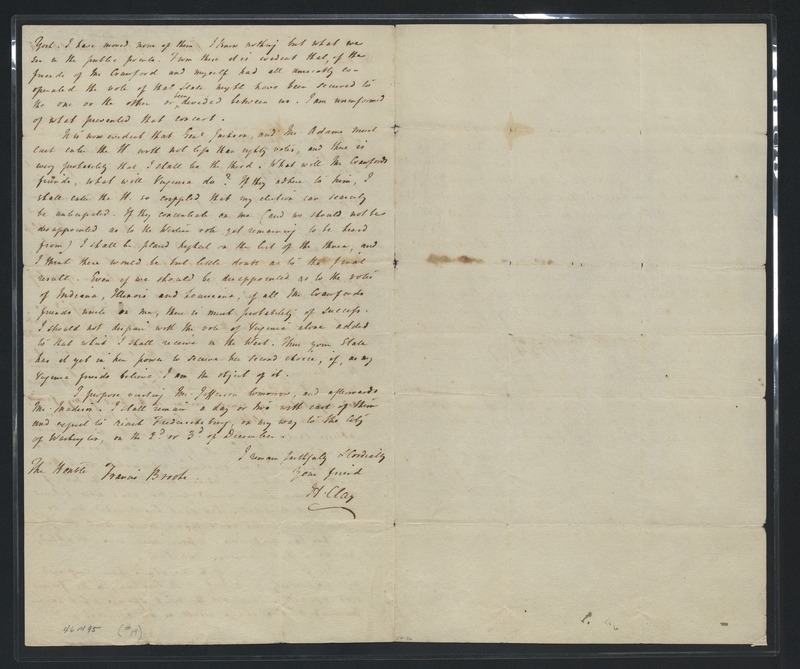 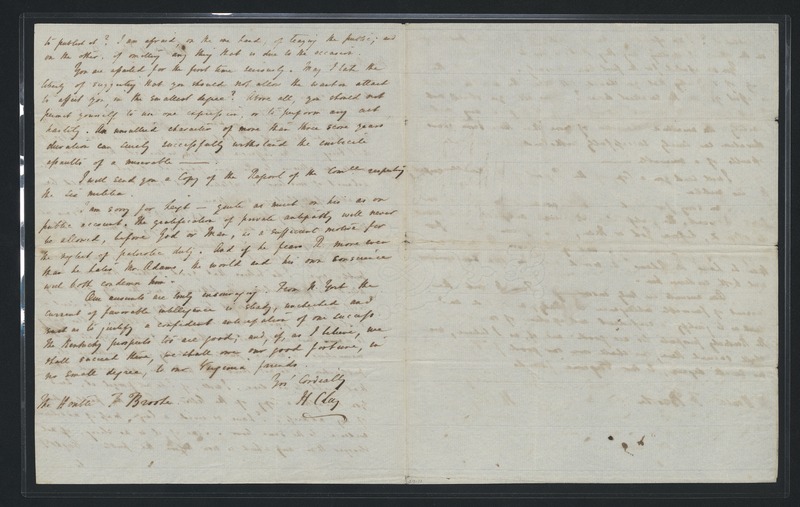 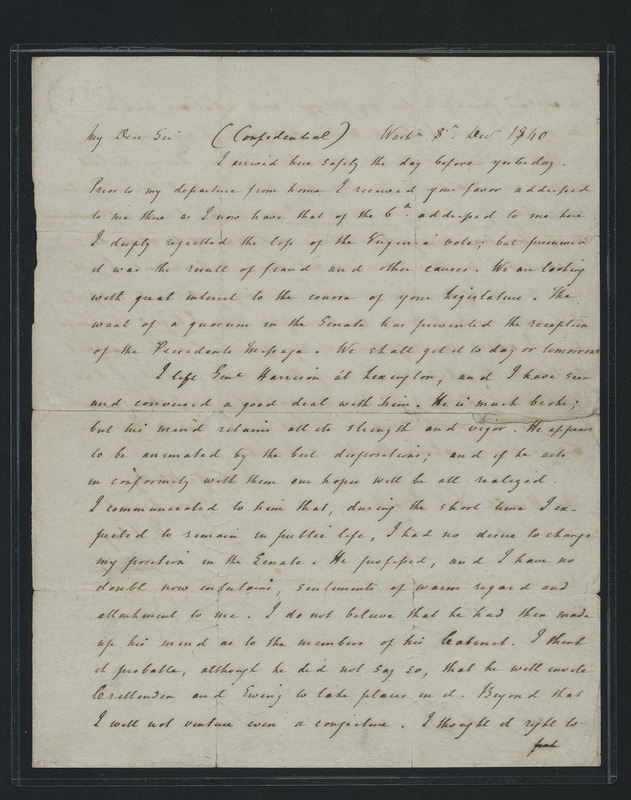 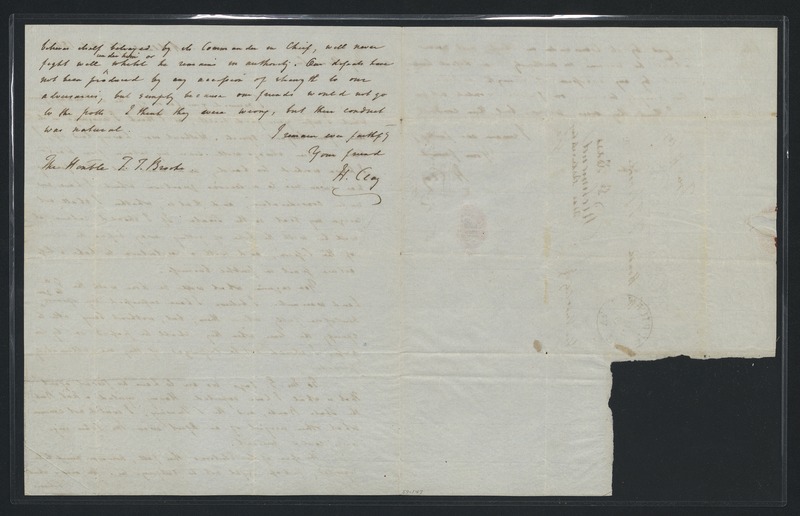 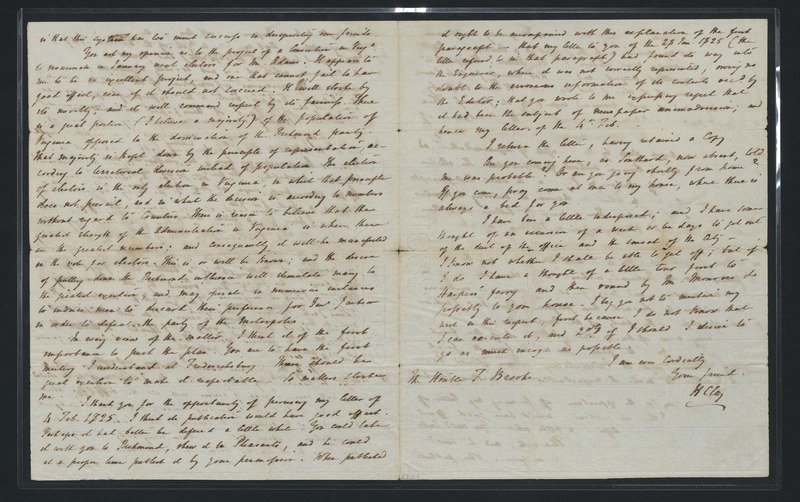 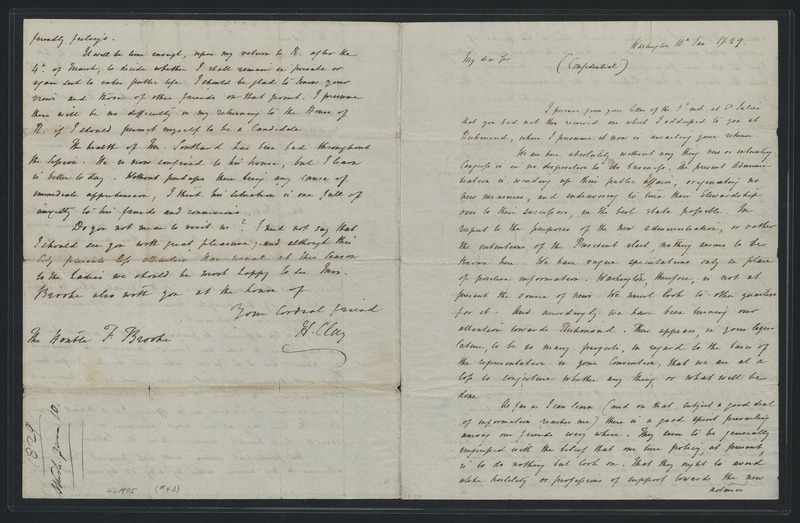 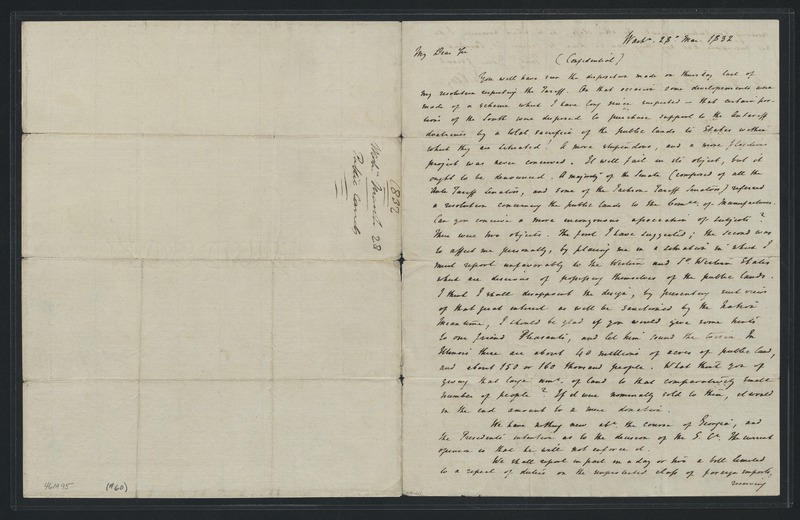 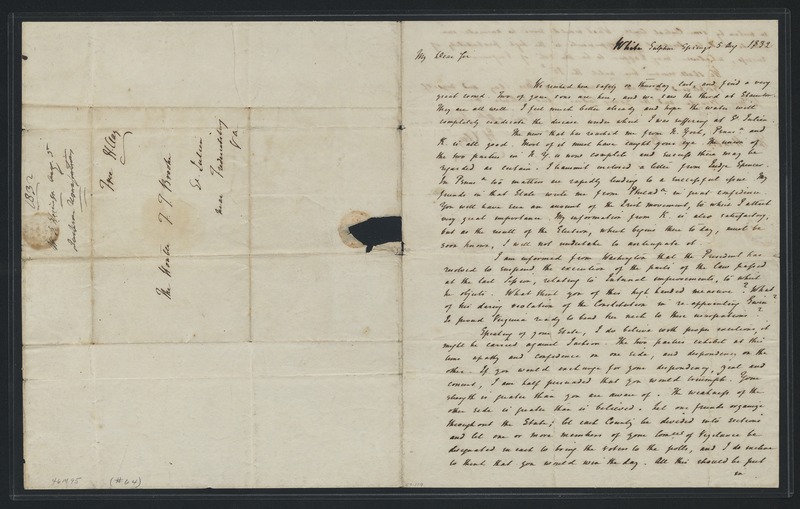 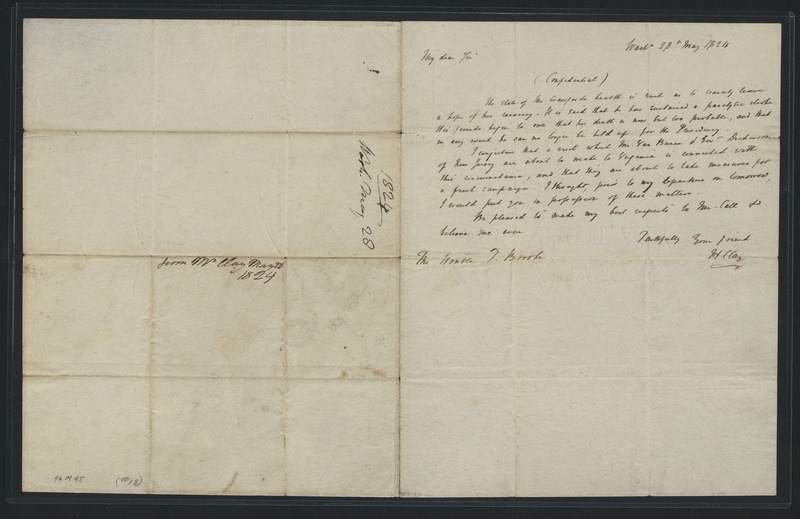 The Henry Clay papers (dated 1801-1843; 0.22 cubic feet; 1 box) comprise letters, a court report, and a print of Henry Clay. 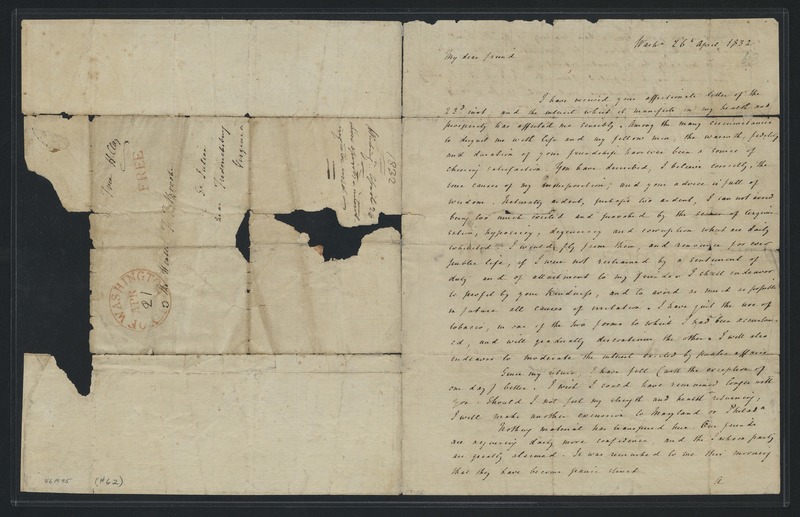 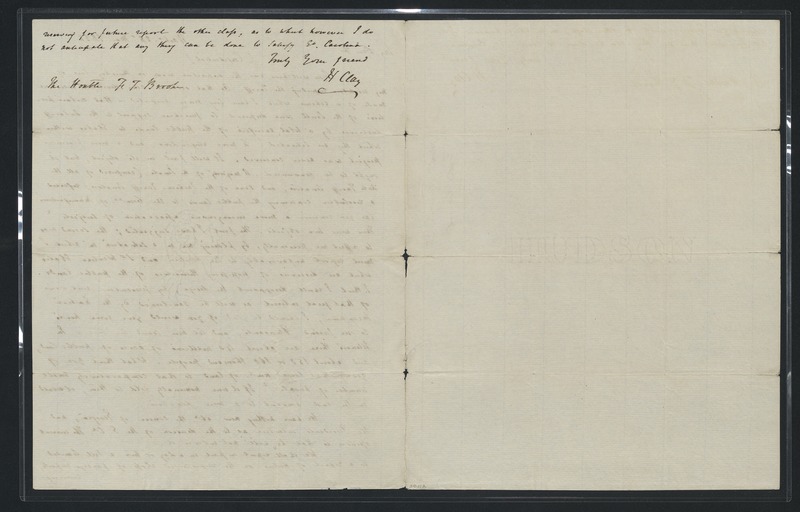 The bulk of the papers consist of letters from Henry Clay to Francis Taliaferro Brooke, a prominent political figure and Virginia Supreme Court judge from Fredericksburg, Virginia. 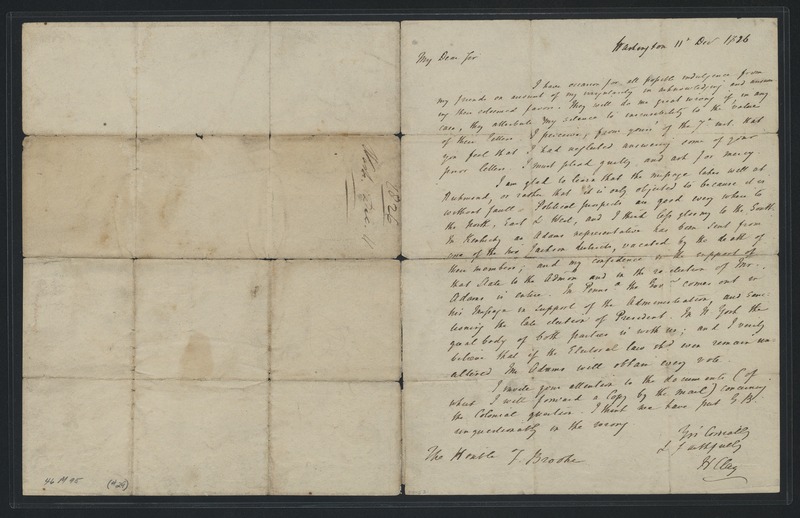 The letters mainly deal with political affairs such as state election results, presidential candidates, and tariffs. 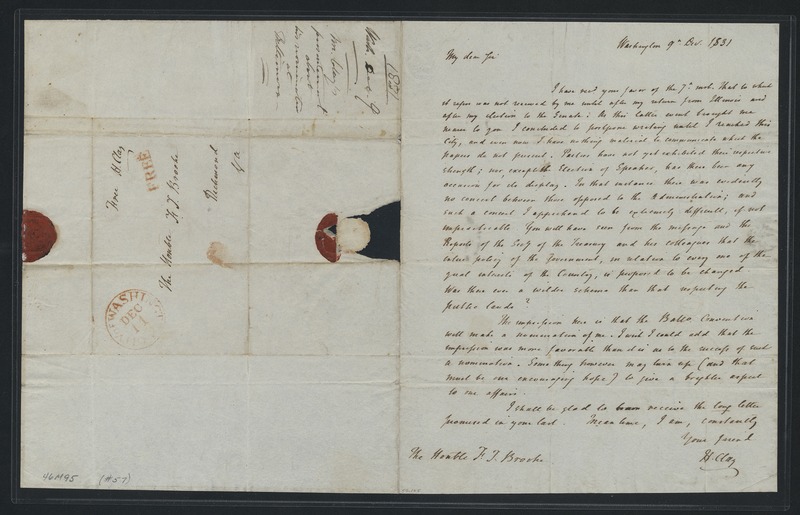 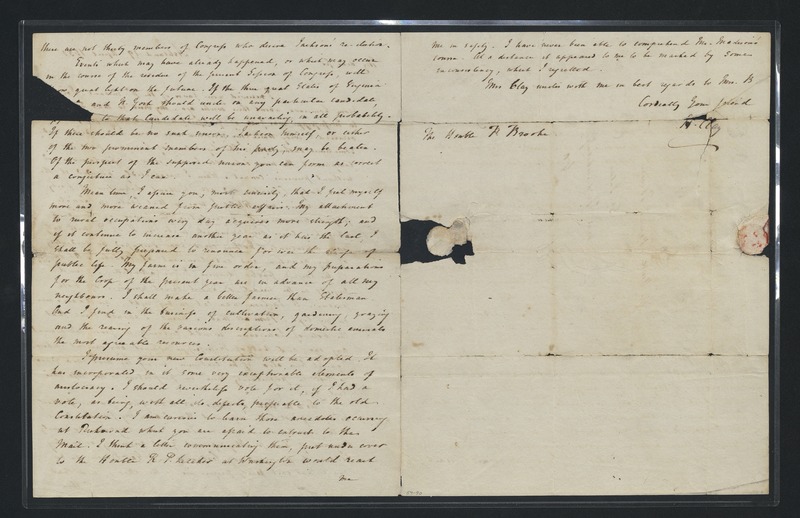 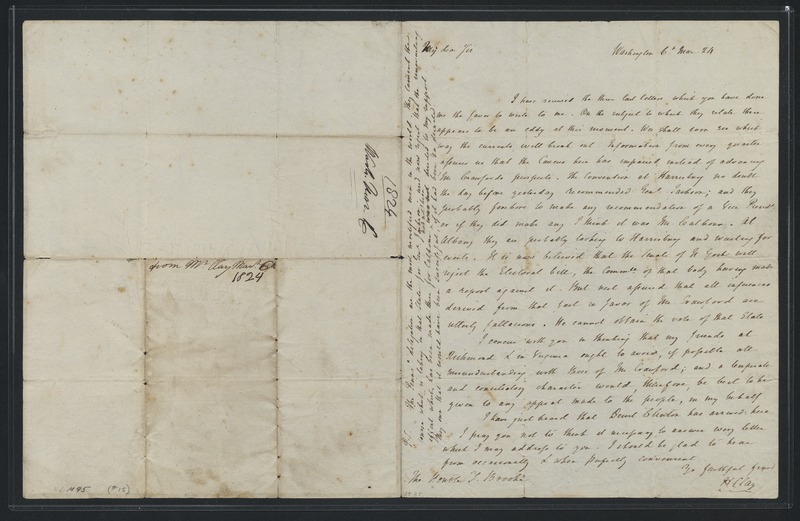 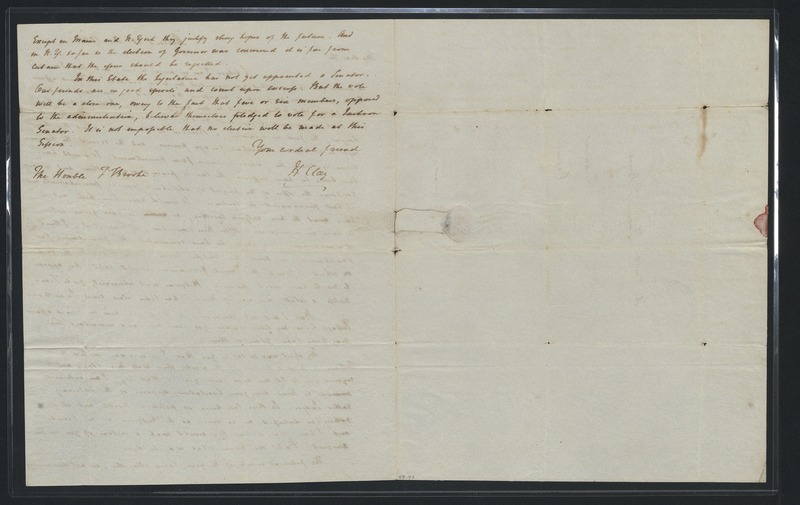 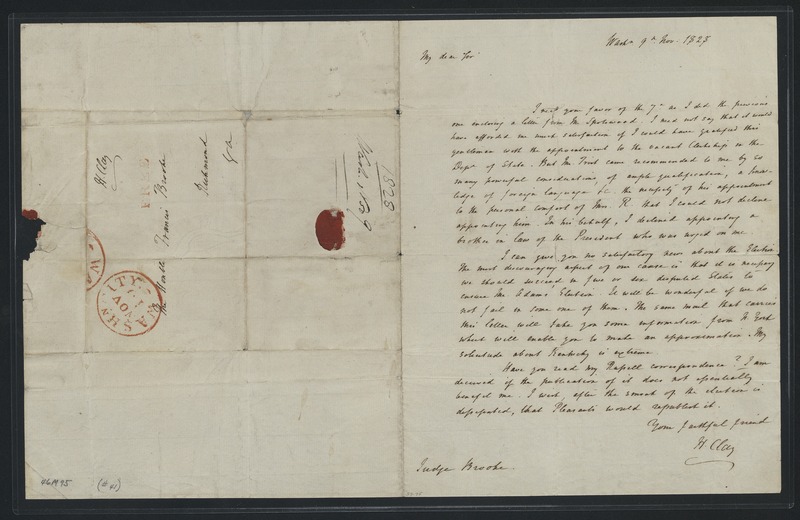 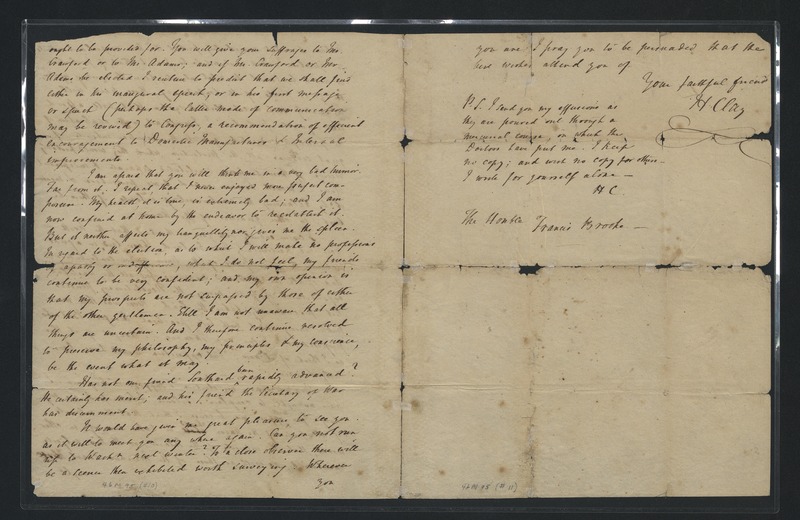 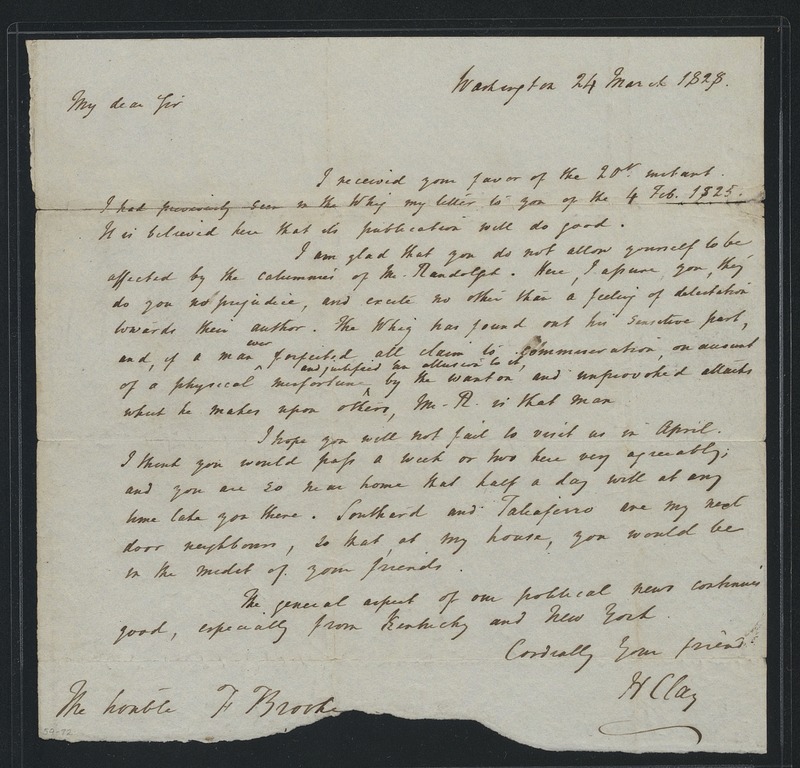 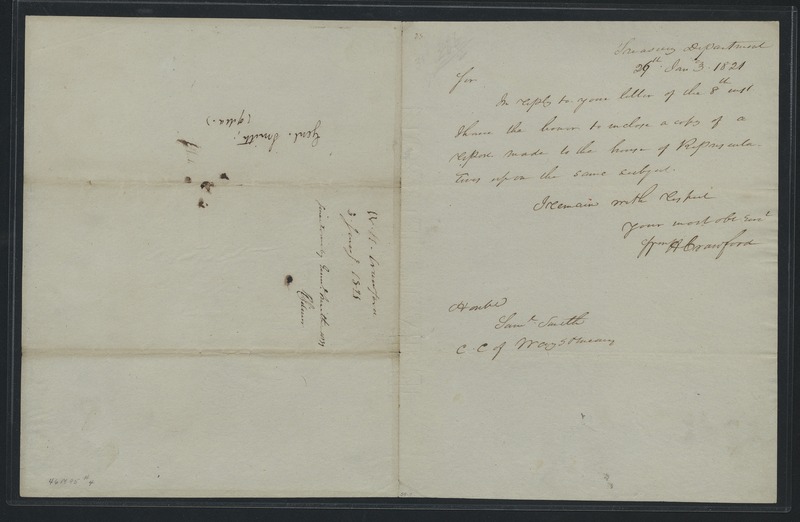 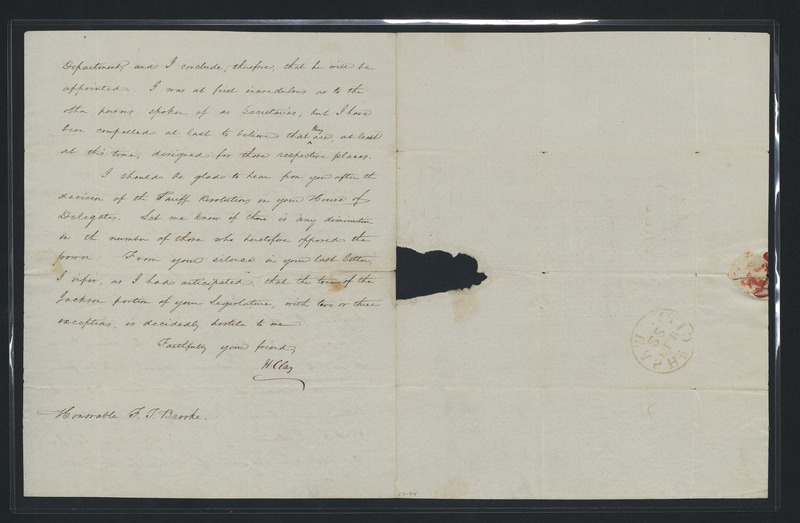 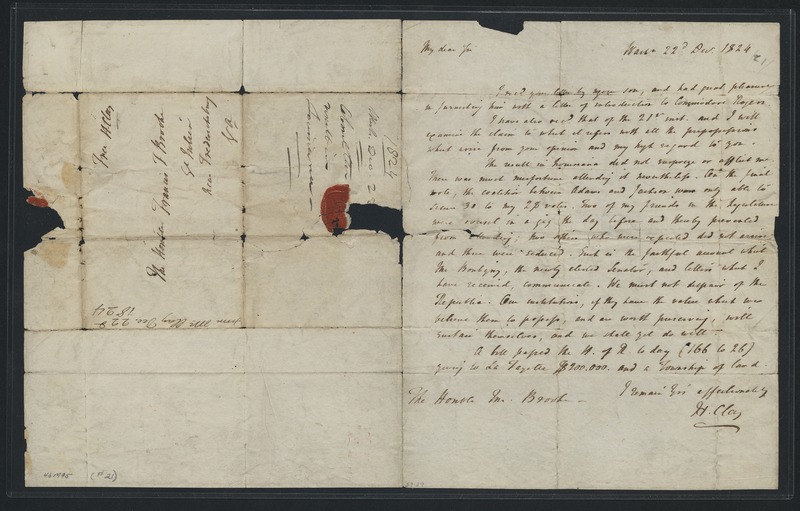 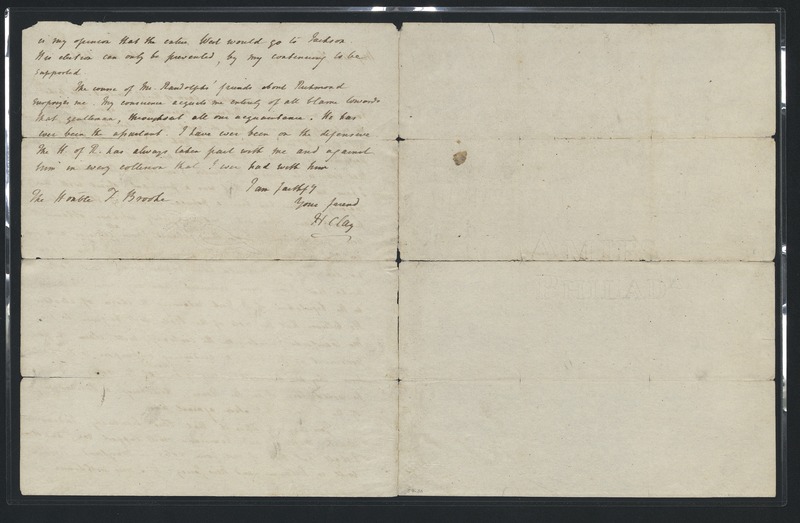 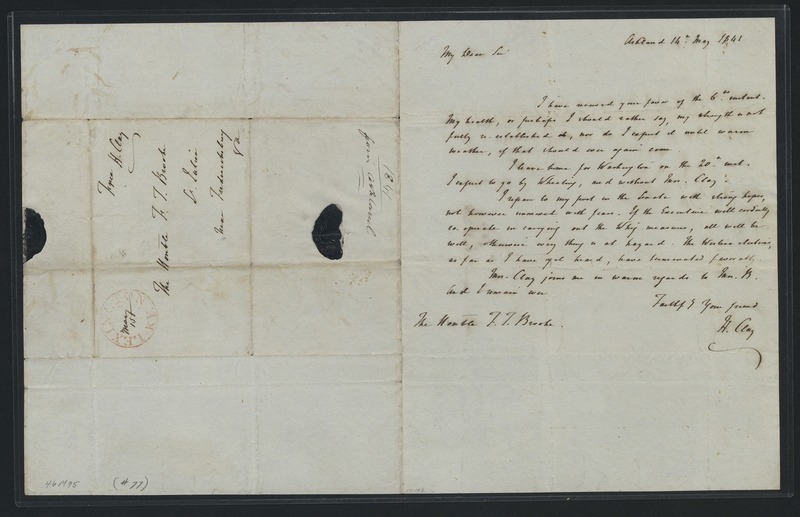 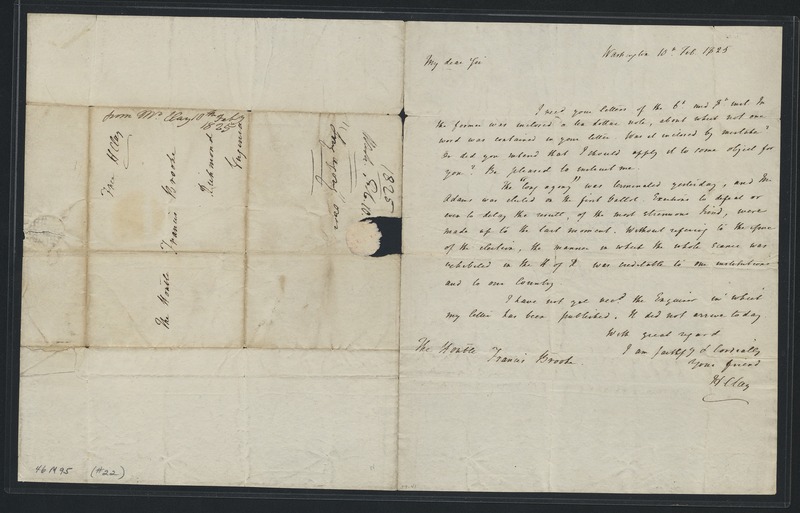 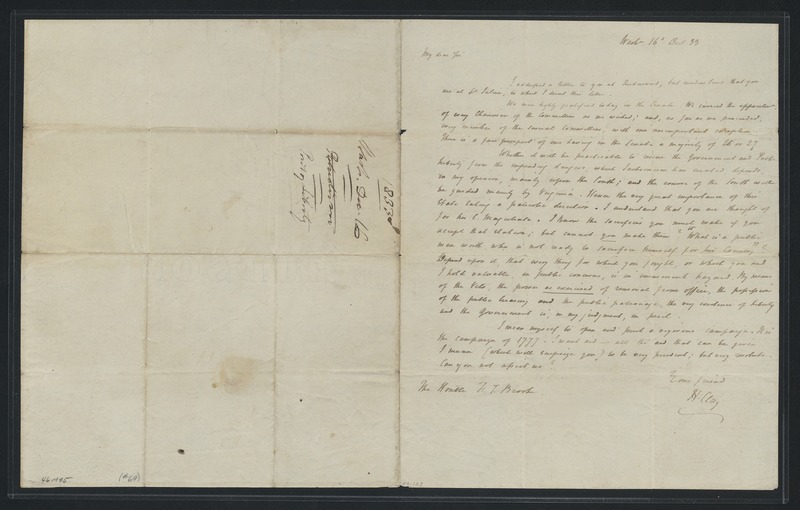 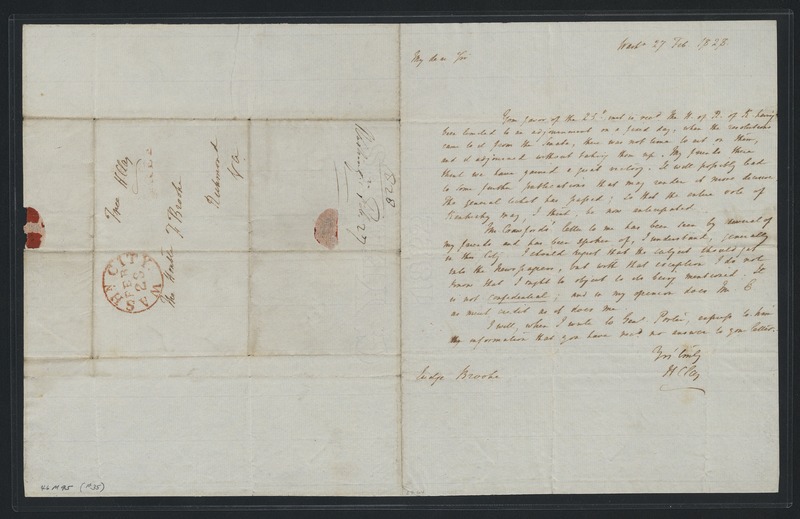 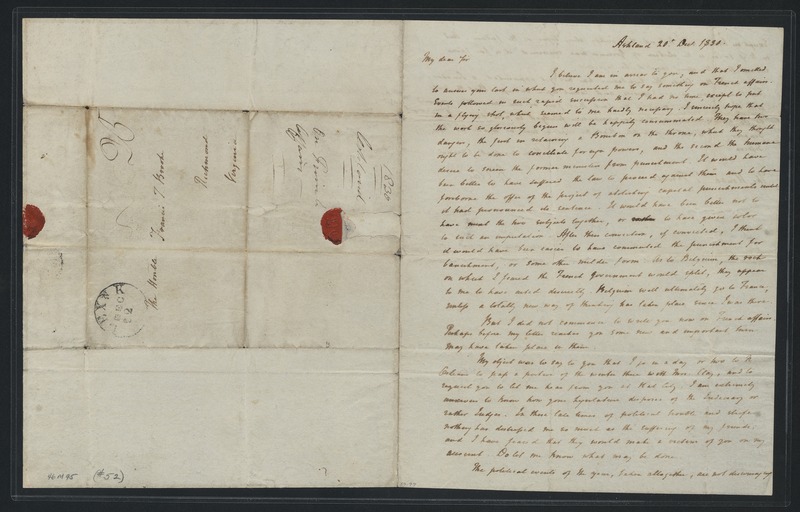 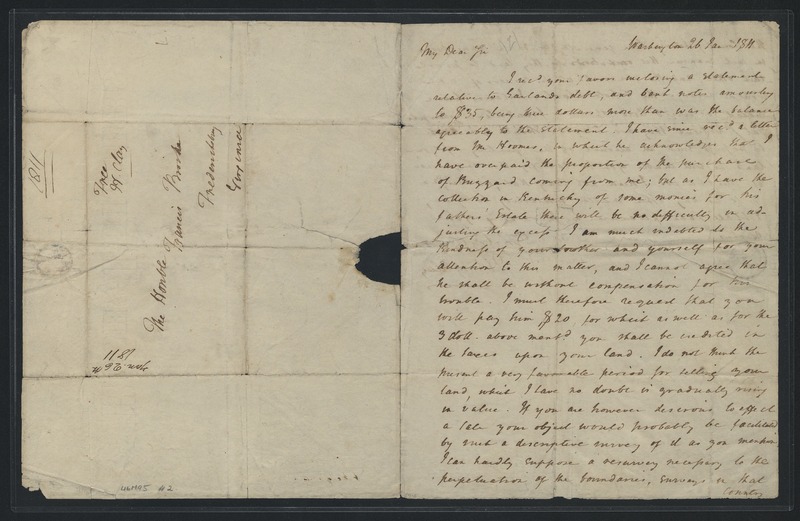 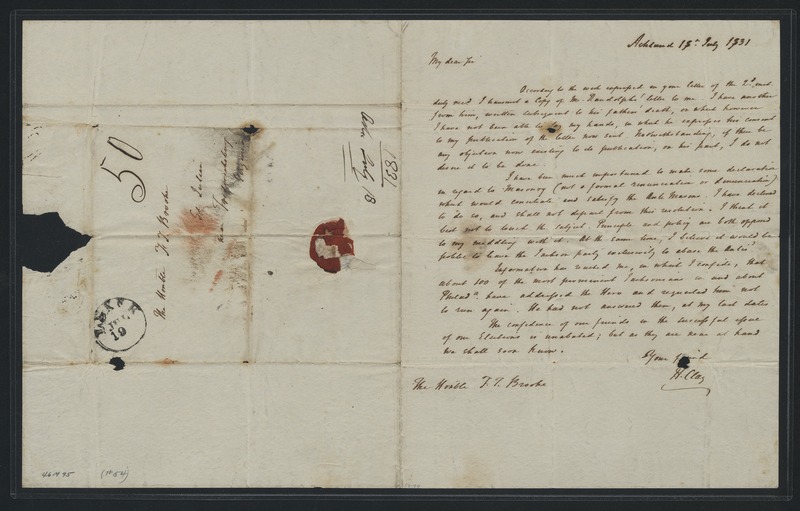 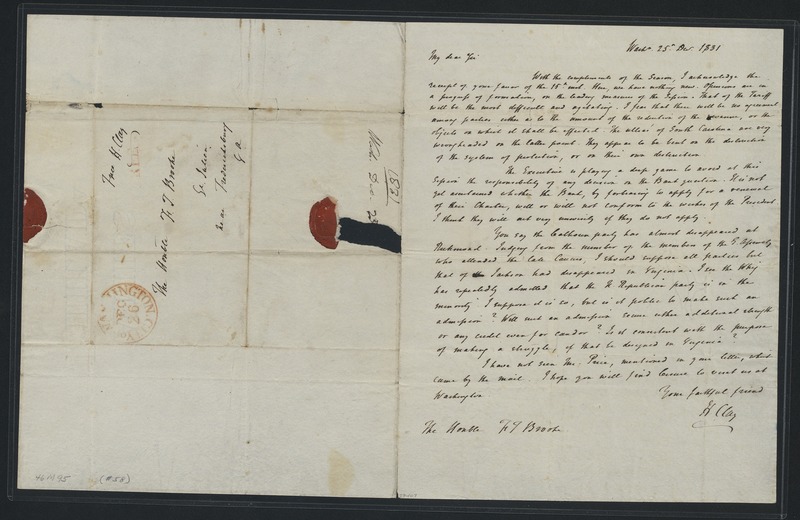 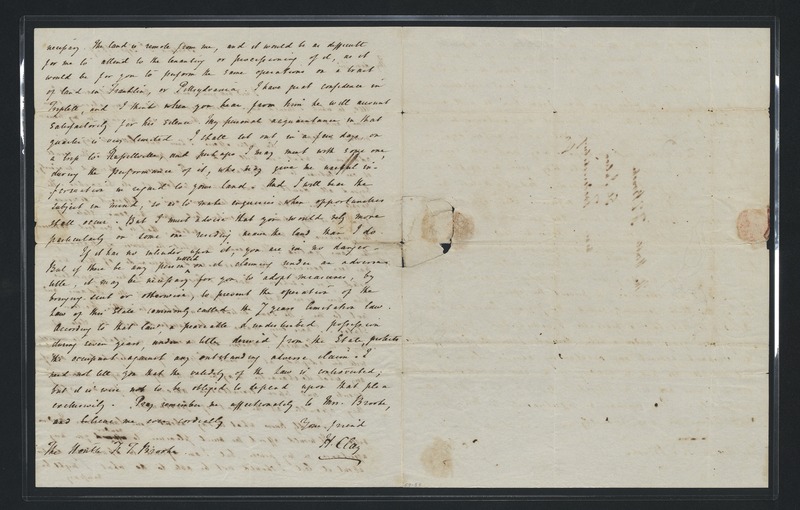 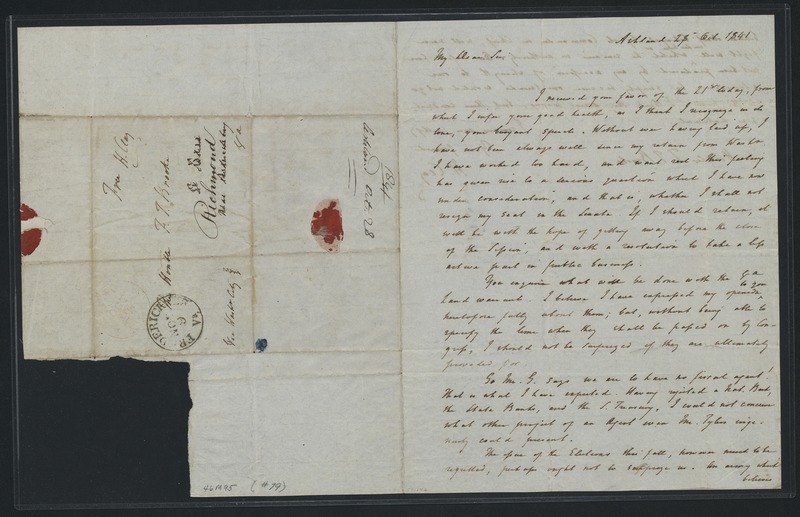 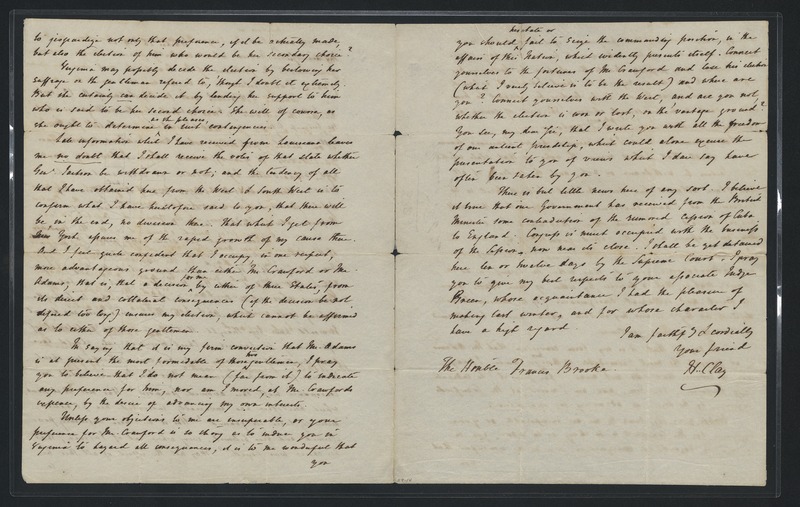 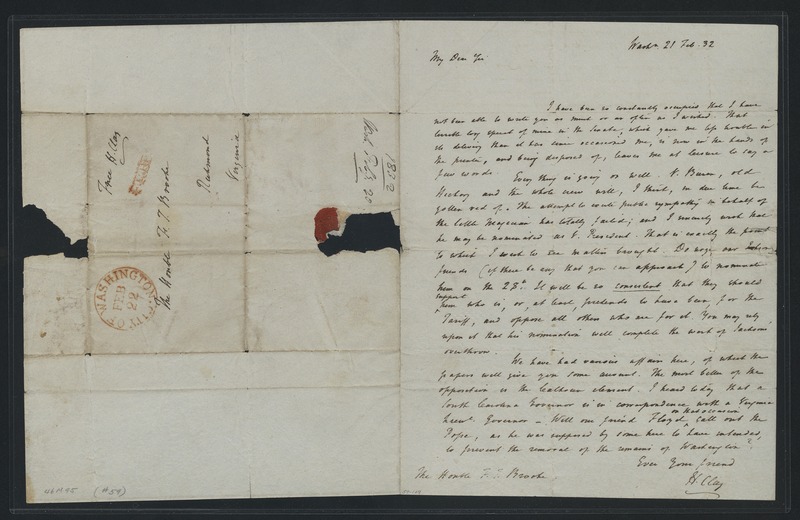 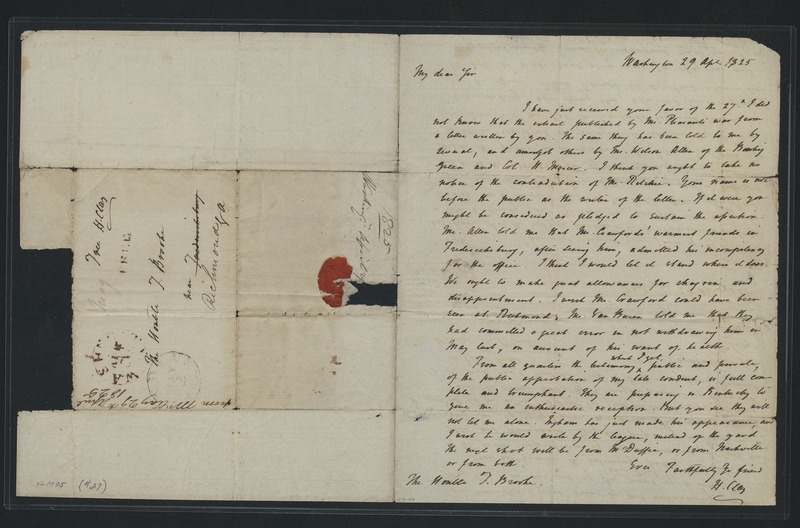 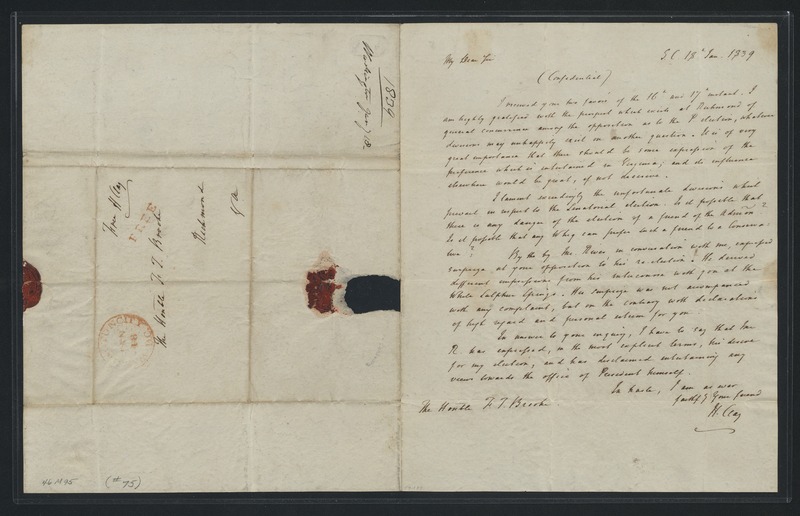 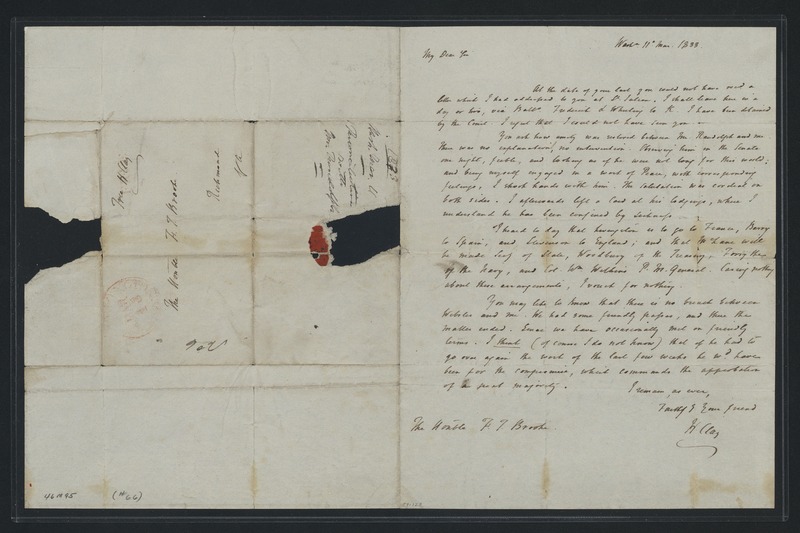 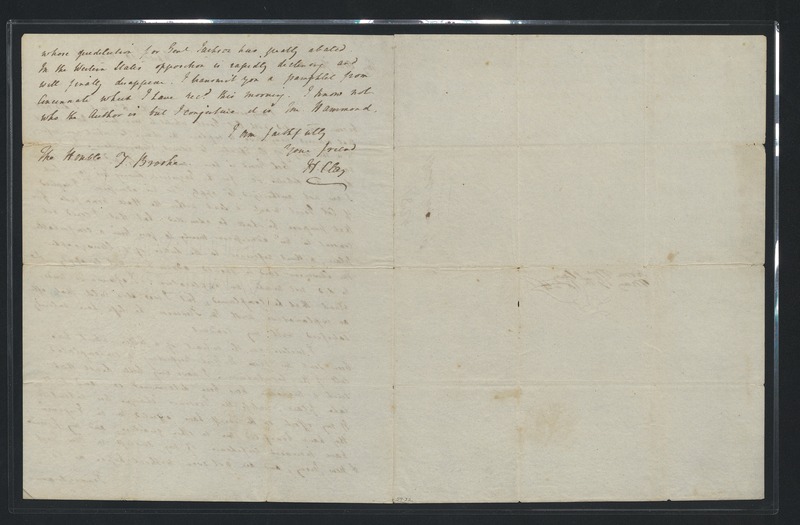 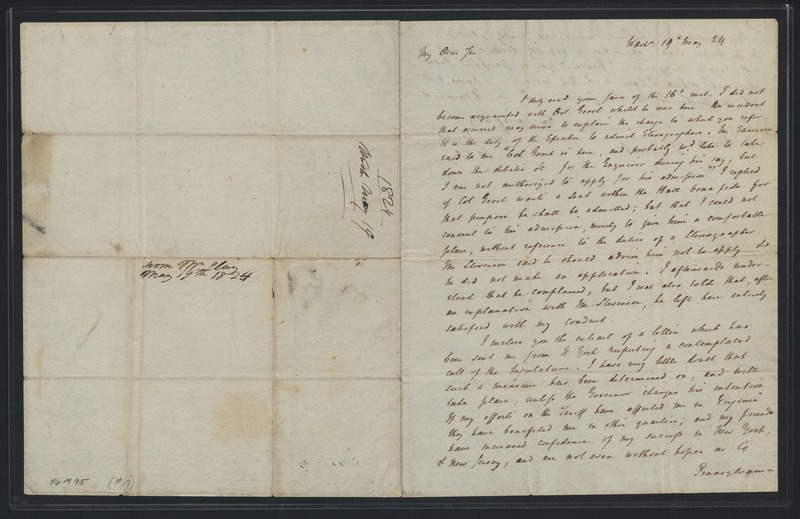 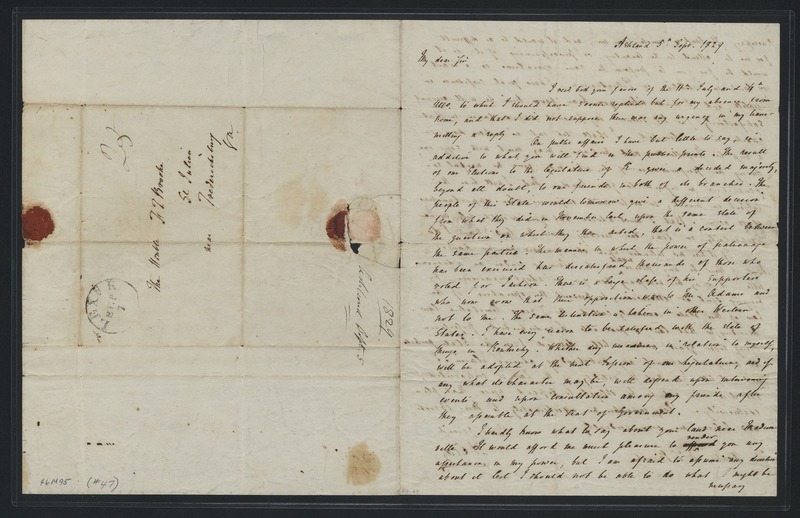 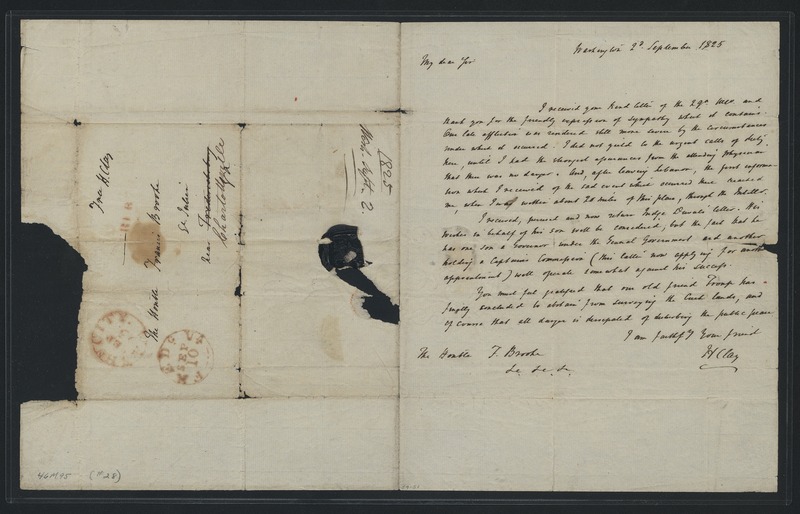 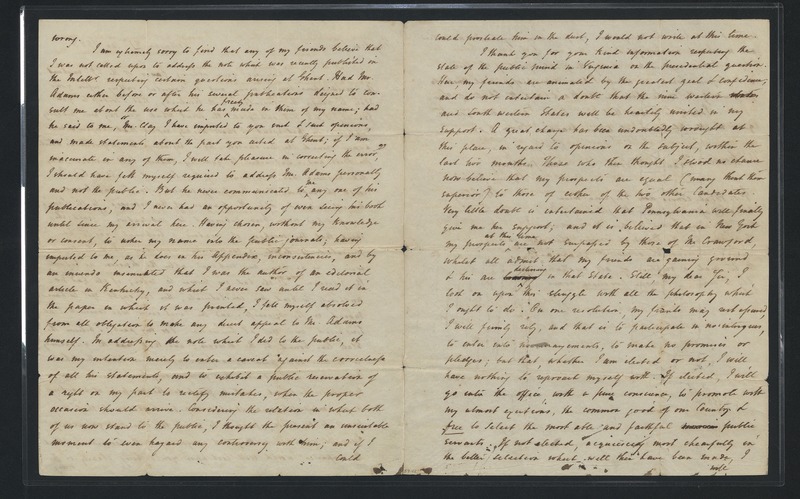 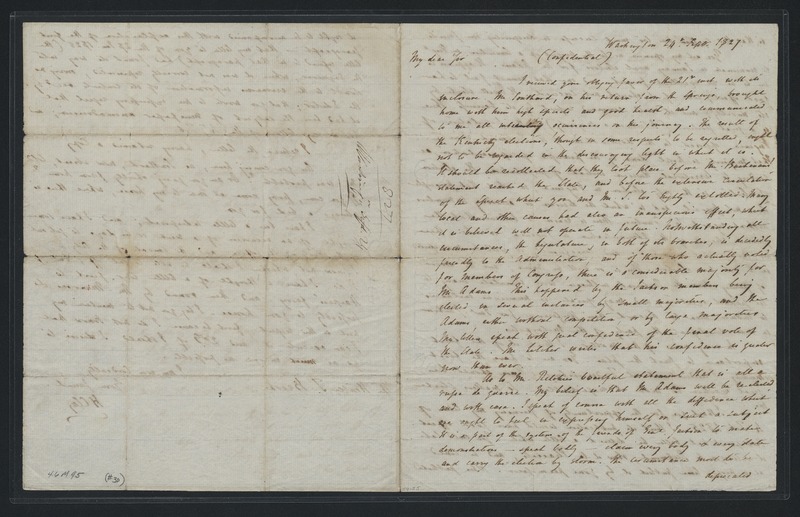 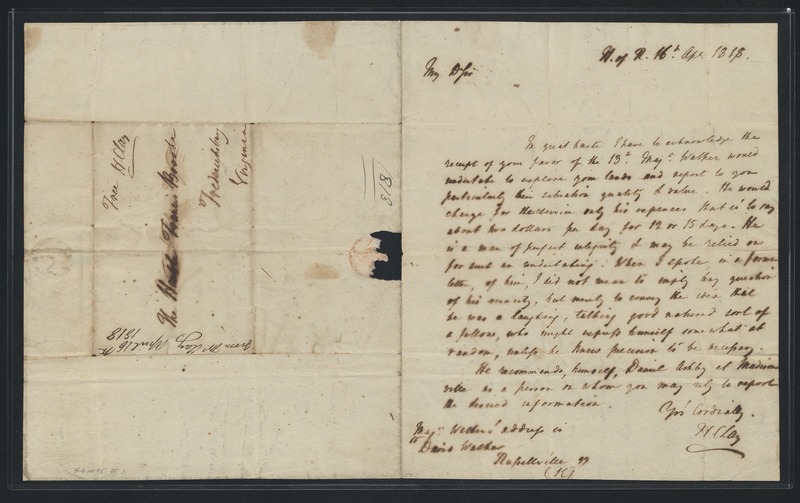 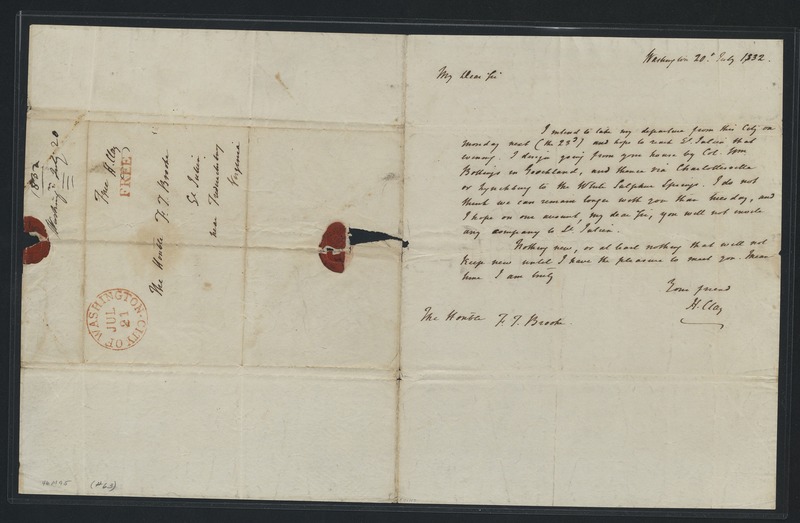 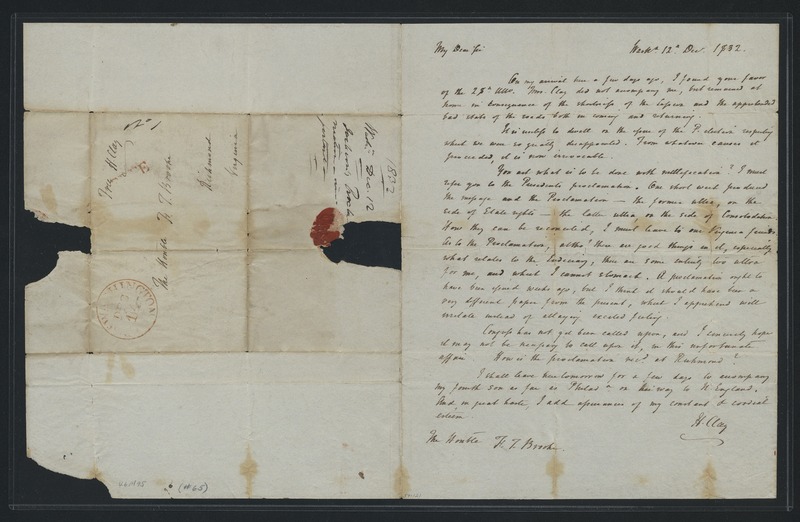 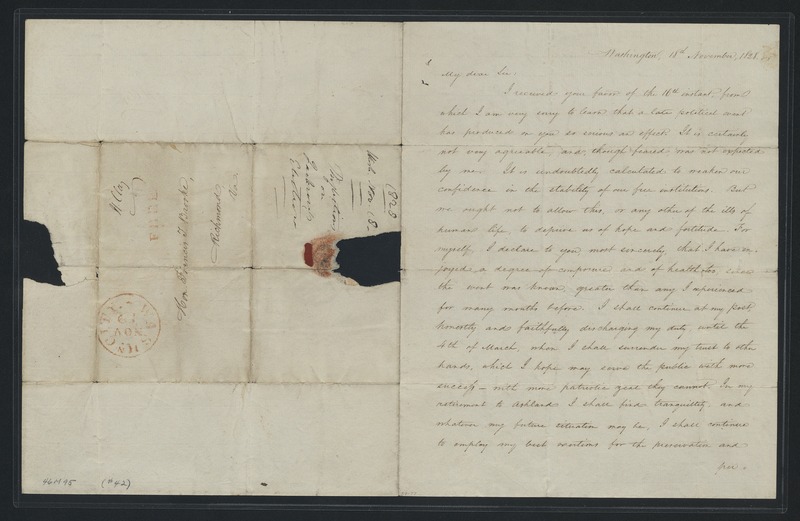 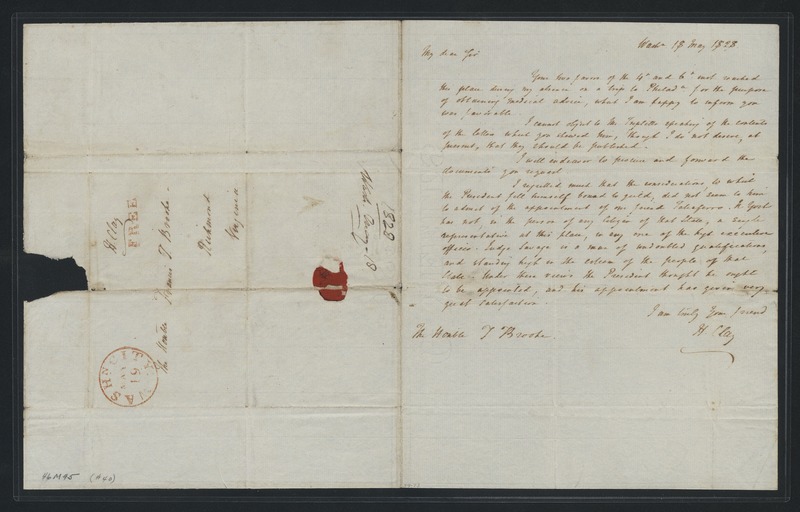 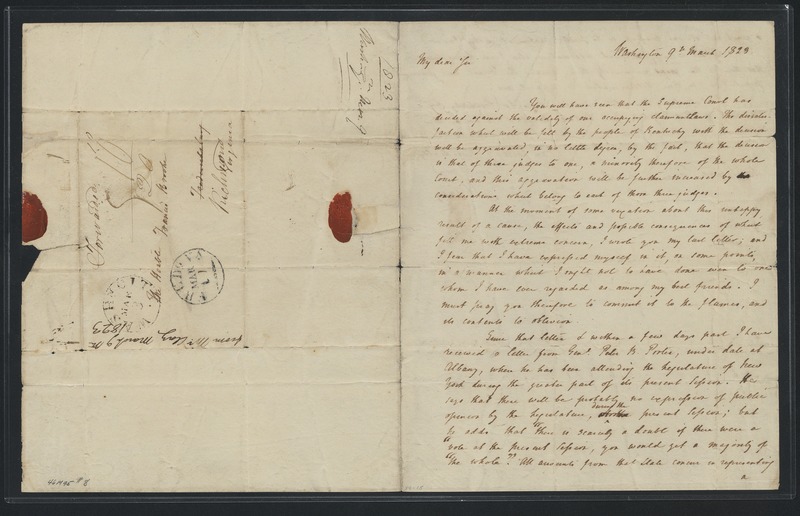 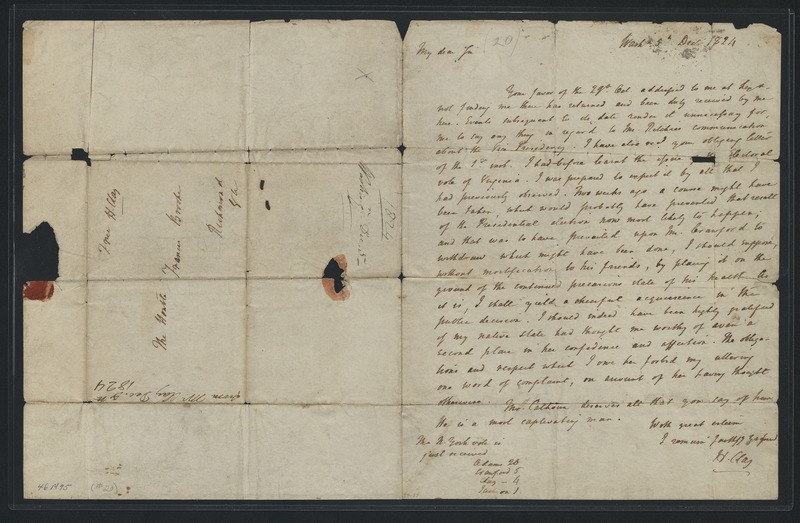 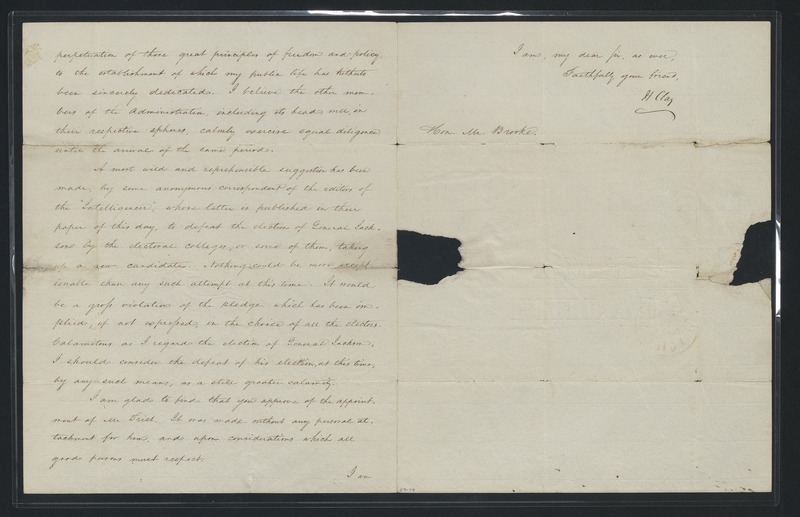 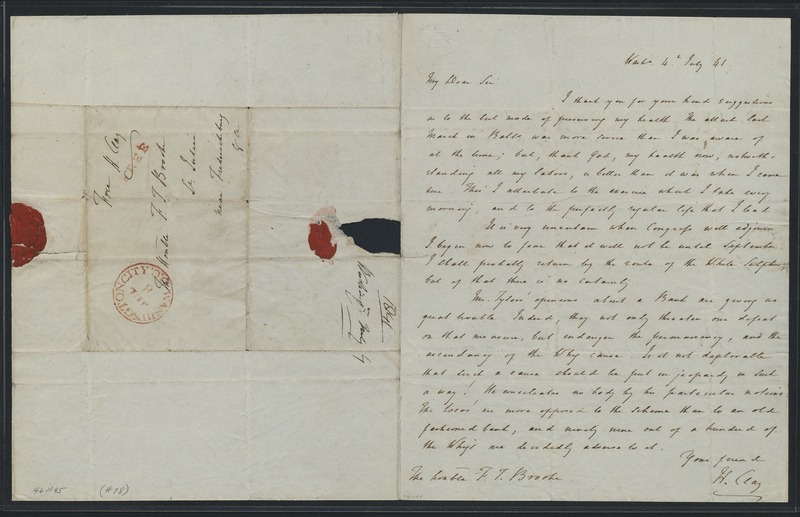 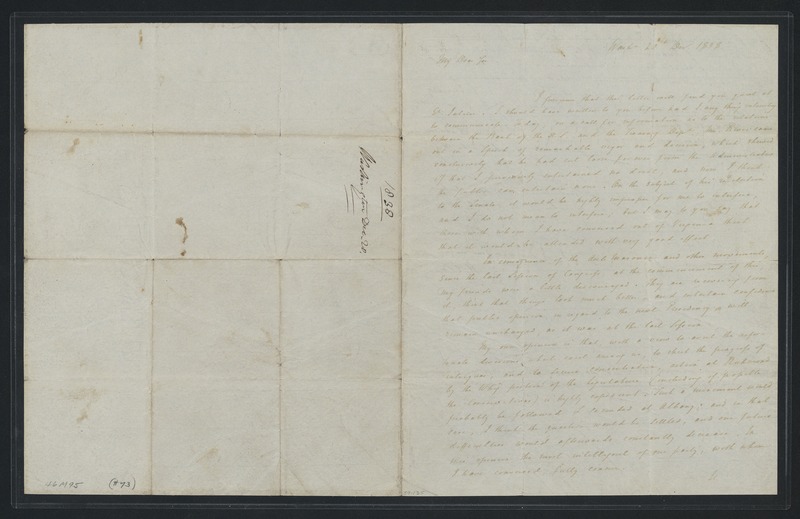 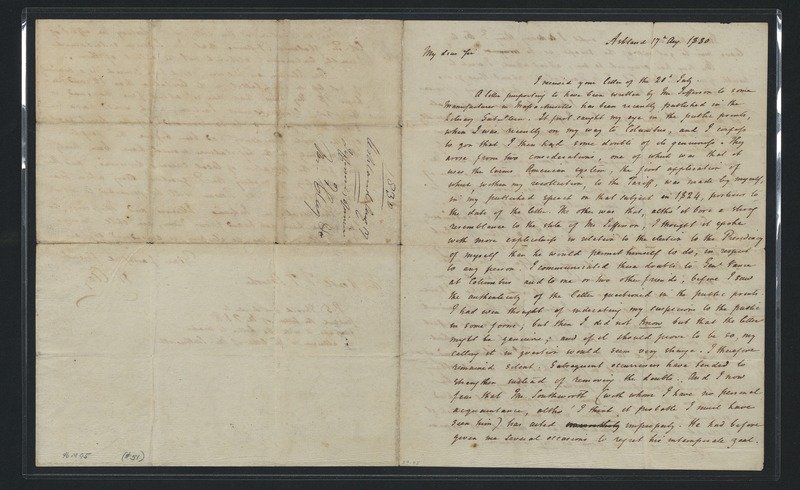 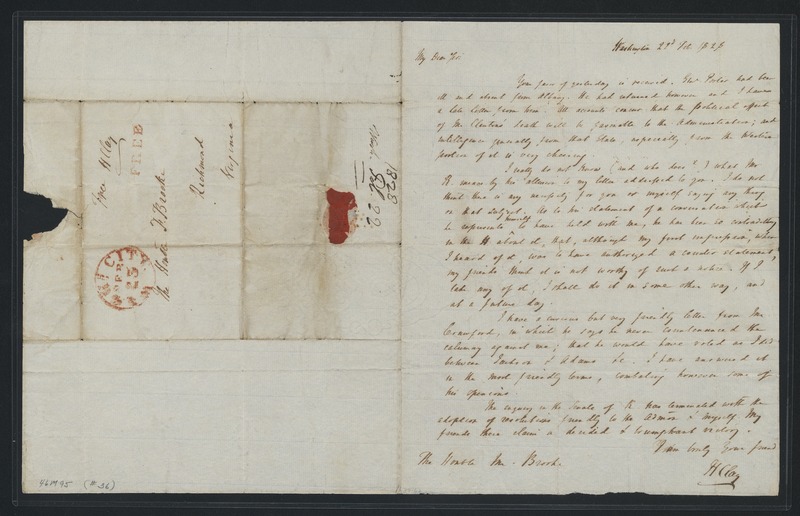 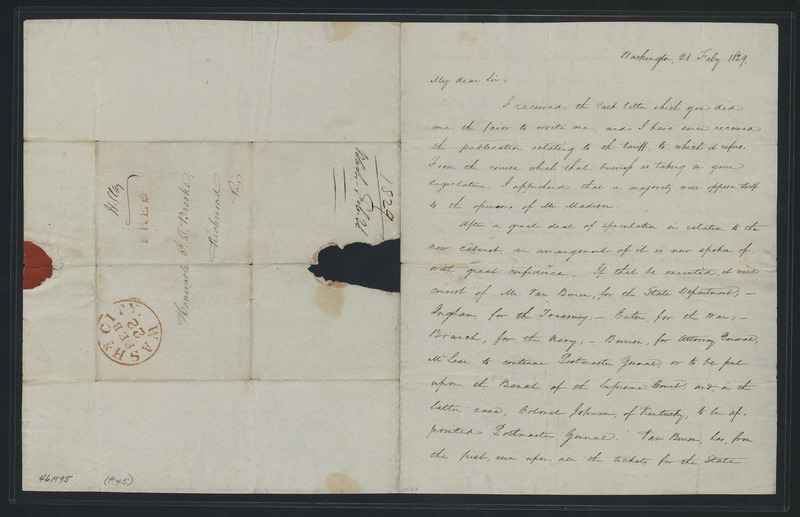 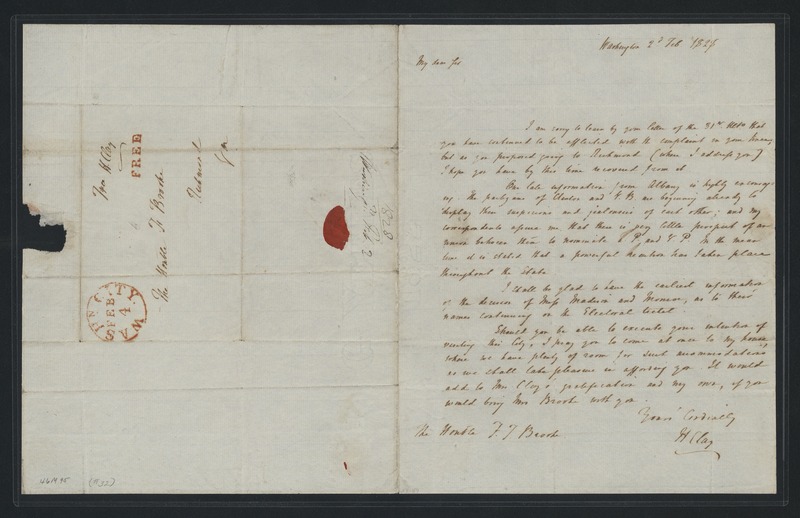 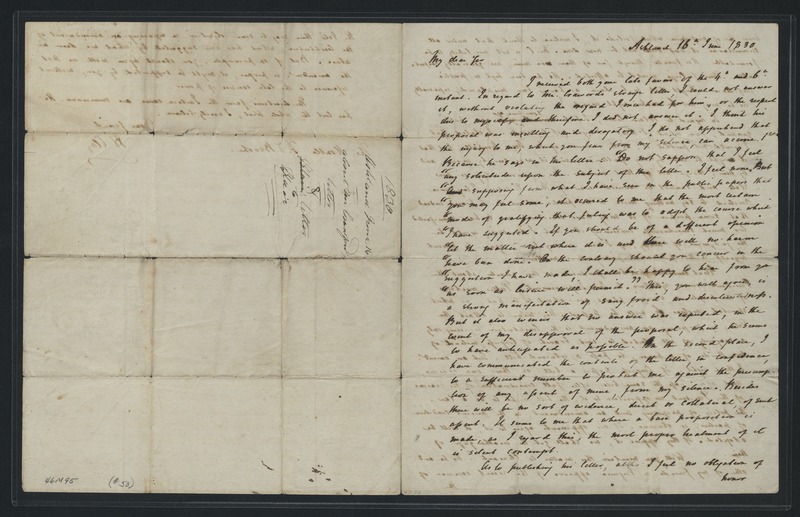 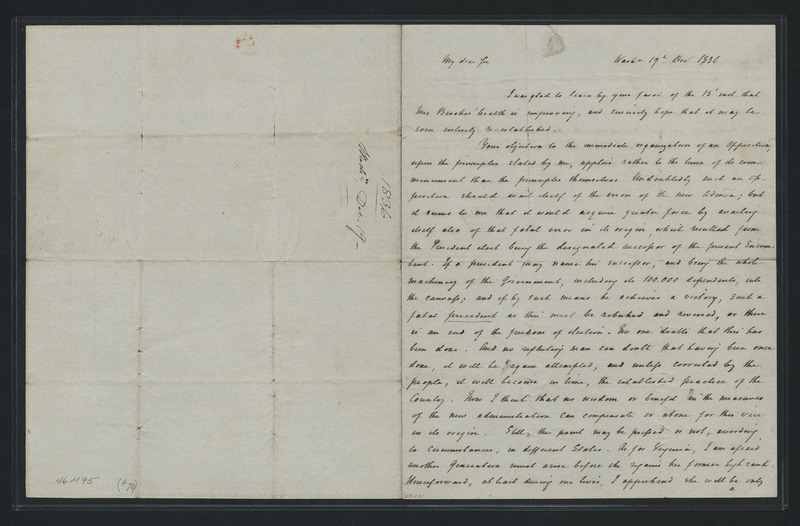 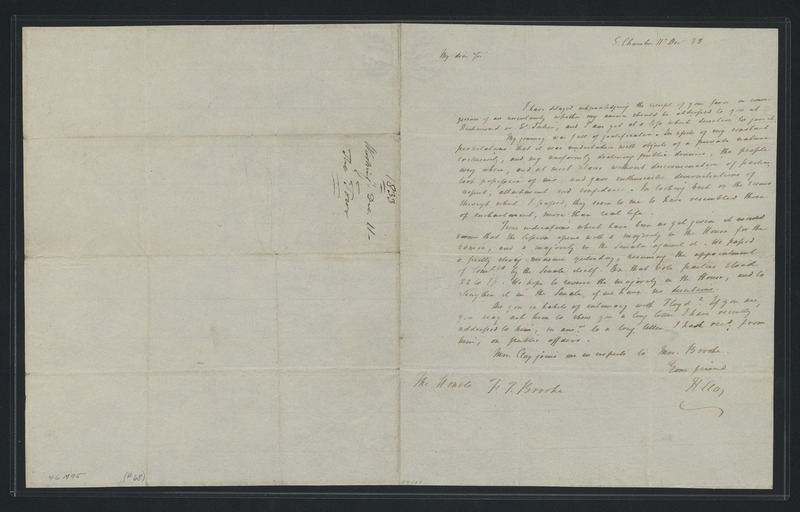 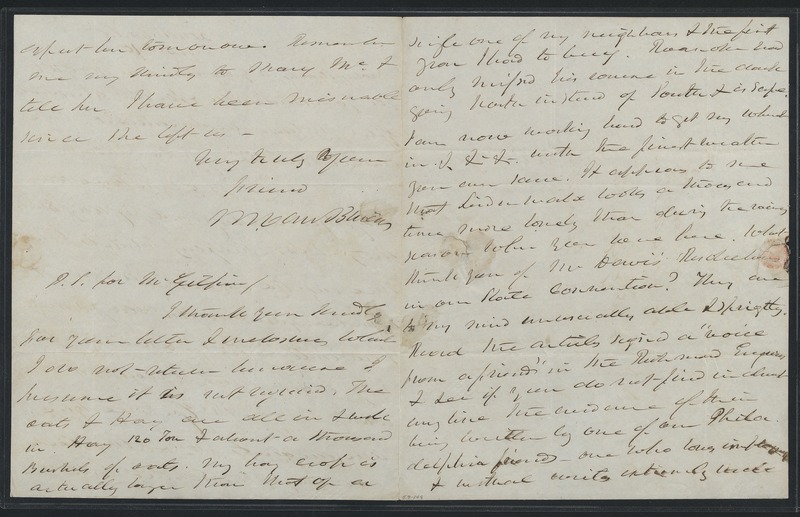 The remainder of the letters relate to William H. Crawford, the Secretary of the Treasury (1816-1825), and to Martin Van Buren, former president of the United States (1833-1837). 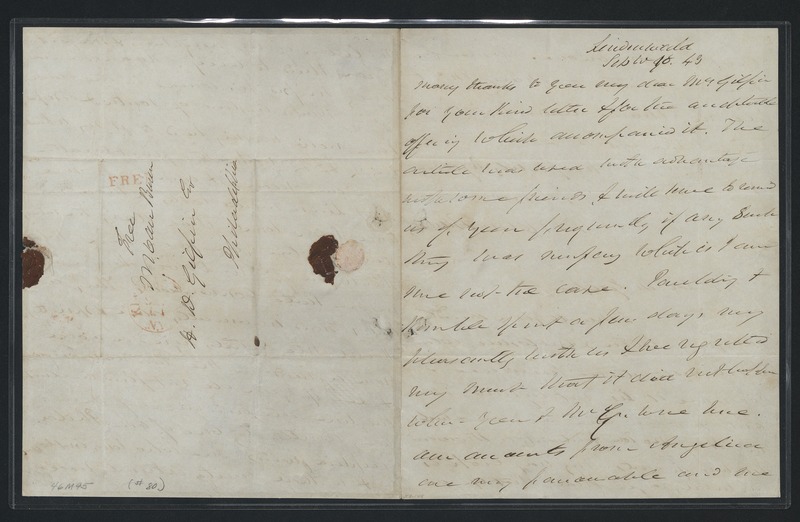 The letters detail the building of an observatory, Department of State elections, and 1828 election opinions. 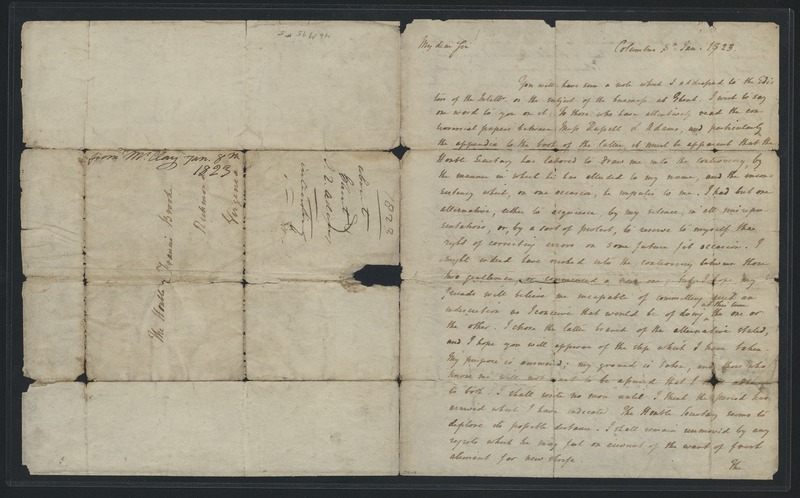 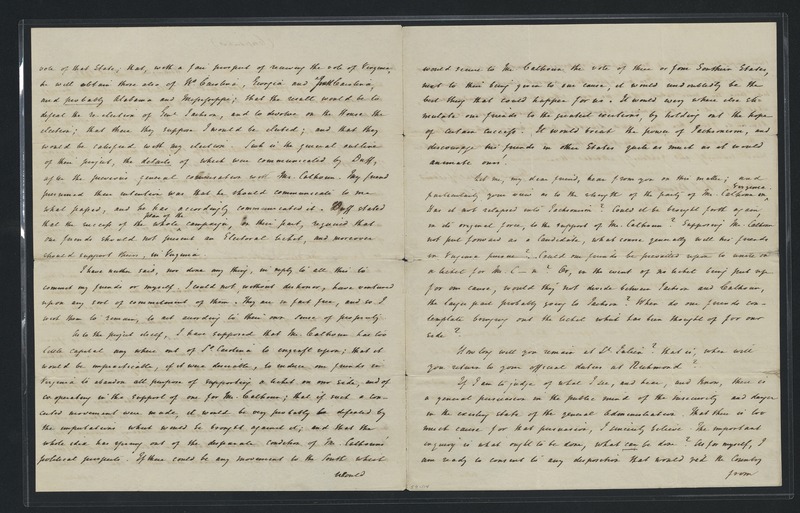 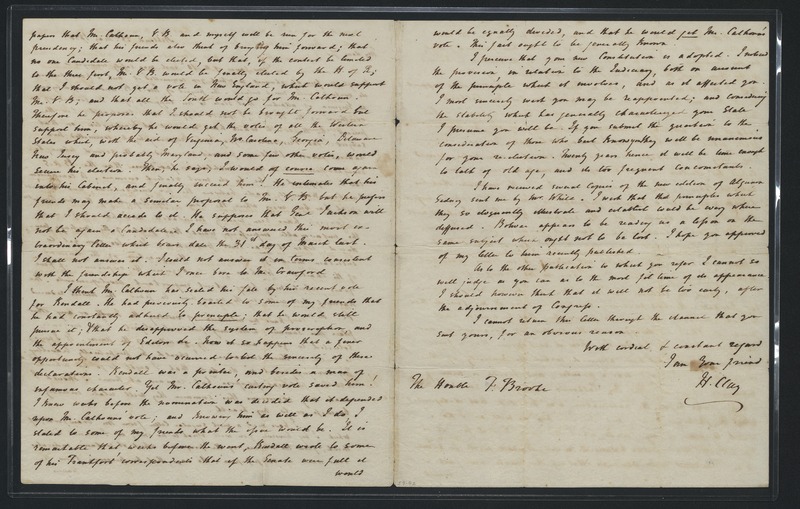 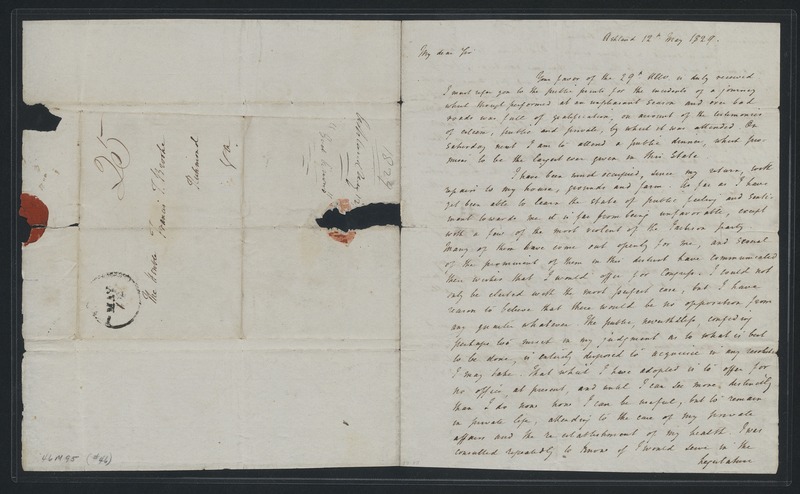 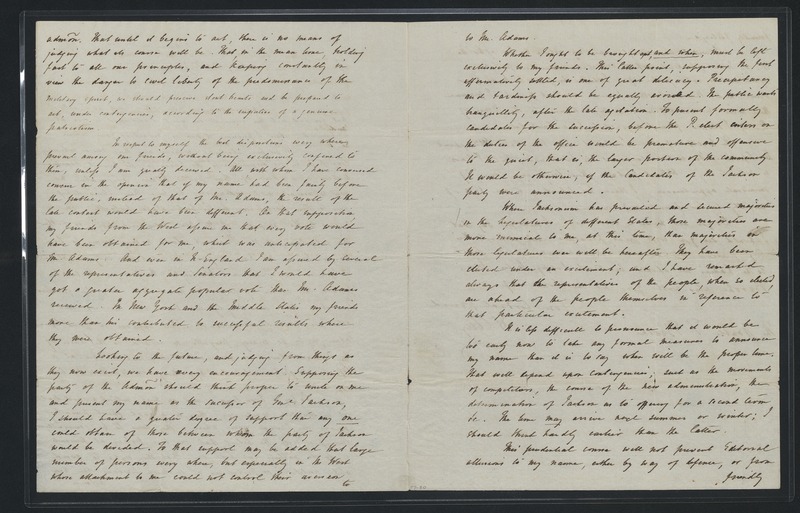 Additional papers include a court report from John and Philip Earle dealing with a report of decree for legal allowances and a print portrait of Henry Clay.